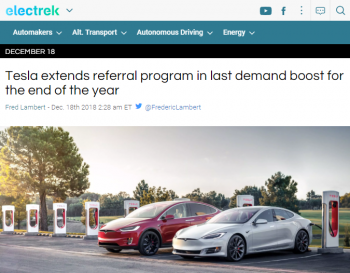 Tesla's new referral program announced Mar 21 2019. What you're looking at is the most anticipated car of all time. With more than a half million pre-orders on the books, the Tesla Model 3 has piqued the interest of more people around the world than any car in history. A vehicle is usually the second most expensive thing we buy in our adulthood, right behind the cost of a place to live. So making a buying decision like this isn't exactly a decision I take lightly, and in some sense this journey began 13 years ago, with the purchase of our family's first hybrid, a year after my wife got her 2005 Honda Civic EX. Yes, we've owned Honda Civics for 29 years. 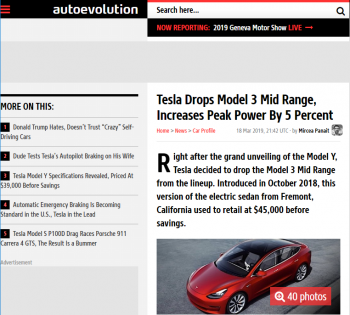 This article is a body of work that is being updated almost daily during these first months of Model 3 ownership. 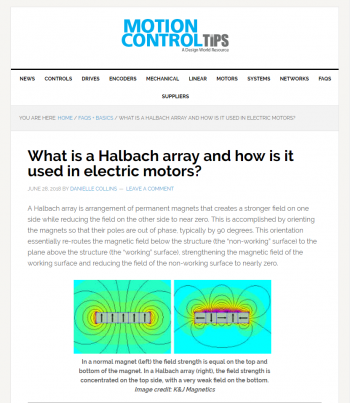 Consider subscribing to be notified of new articles. I do not own any stock in Tesla. Why not a new Honda Insight Hybrid? Why not any other all electric? Dec 18 2018, 19, 20, 21, 22, 23 Delivery Day!, 24, 25, 26, 27, 28, 29, 30, 31 updates. Jan 01 2019, 02, 03, 04, 05, 06, 07, 08, 09, 10, 11, 12, 13, 14, 15, 16, 17, 18, 19, 20, 21, 22, 23, 24, 25, 26, 27, 28, 29, 30, 31 updates. Mar 03 2019, 04, 08, 14, 15, 16, 17, 18, 19, 20, 21, 22, 23, 25, 26, 27, 28, 29, 30, 31 updates. 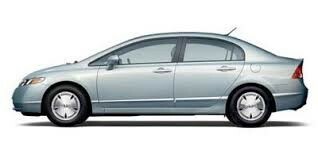 2006 Civic Hybrid has 5 star front and side driver protection. What moved my family from just-in-case/someday pre-order back in August of 2017 to actual order just this past Wednesday? It was partially about safety, freeing up my beloved 2006 Honda Civic Hybrid to be given to one of my sons with some car troubles. The Civic features side and front airbags, good crash protection, excellent economy, and modest insurance costs for a young person with an excellent driving record. Yes, I'm sometimes a bit of an Early Adopter. I'll admit that there was considerable allure to joining in to the growing Hybrid trend back in March of 2006, when I placed my order for my light blue/gray Honda Civic Hybrid with Tan leather seats in February of 2006. A "green" car was a bit more about the promise than the reality, back then. That was a long time ago. I quickly fell for my little Hybrid during a test drive, and ownership went well, driving a LOT for my job commuting an hour each way every day back then. I could even use the HOV lane even when driving solo on Long Island, where many of my customers soon were. 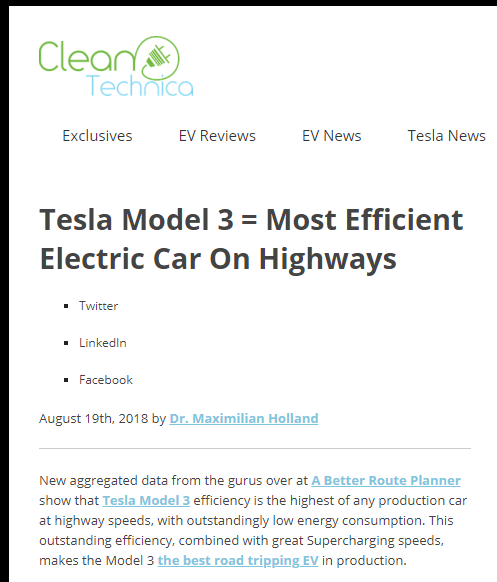 My efficient, aerodynamic, and modern good looking ride has been featured in articles right here at TinkerTry and on Twitter, and it has been far and away the best car I've ever owned, especially when measuring operational costs per year. Another big reason was that I also love the automated climate control that was only available in the Hybrid, and I’m glad I got the navigation option, allowing me steering wheel controls of my years of podcast listening. Yes, driving a Civic Hybrid was a statement, much like the Toyota Prius, but a whole lot less goofy looking, see specs at Honda. Yes, that's what 47.0 mpg looks like, and I've been used to that for 13 years! Yes, I drove my elementary and middle-school age sons around a LOT in this car, and it sure got the job done. No significant maintenance issues outside of normal wear items, and a Nickel Metal Hydride (Ni-MH) Battery that thankfully died right around 98,000 without stranding me, still drivable. Replacement didn't cost me anything under the 100,000 mile warranty. I've never owned a vehicle with so few issues, and yes, I did feel I had dodged a ~$2500 bullet with that fortuitous timing. It's at 165,000 now, that's 12,692 miles per year. 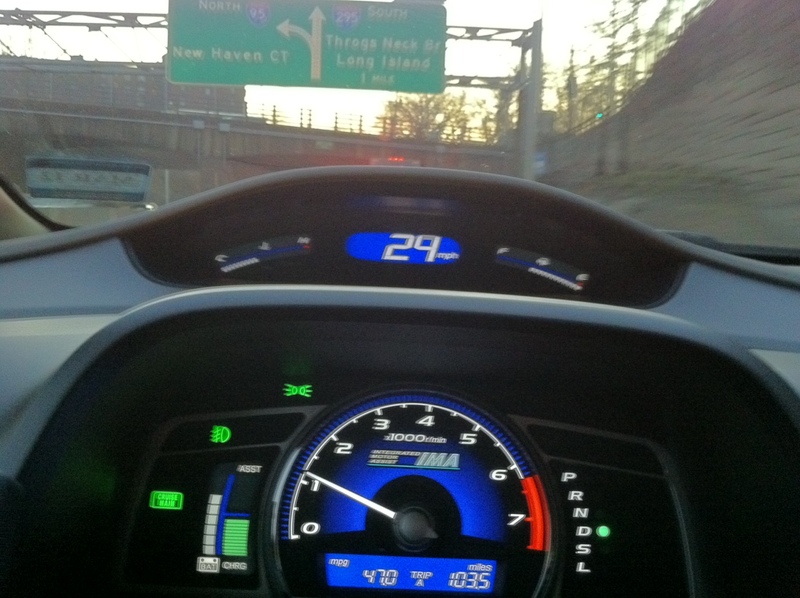 This hybrid sometimes obtained a remarkable 47 mpg, seen here, headed from central Connecticut straight to JFK. It's especially nice to see my sons become more interested in avoiding gasoline chugging vehicles with less of a carbon footprint, having been accustomed to compact cars all their lives. I personally can't believe how many huge sport utilities vehicles Americans drive around these days. What were the drawback to this small car? It wasn't a particularly quiet ride, even with the continuously variable transmission. Acceleration could be quite weak when in traffic during hot weather, when the 20 horsepower electric motor isn't boosting the modest 110 horsepower gasoline engine much, if at all. New Hondas, such as a Civic? They no longer make a Civic Hybrid. How about the Insight? It's not all electric is the big thing, do I really want to drive such a thing for the next decade+? Civic and to some extent the Insight have a muscular youthful look that prioritizes cosmetics way above mileage. Sorry Honda, not for me, but thank you again for a great 13 years! Even if there were an all-electric Honda that suited me, having access to a charging network would certainly be a challenge for what I need right now, a car that gets me to work, and to customers and back again, getting back home faster and far more efficiently, with a network of Superchargers to save me should I actually run low when out and about. Same issue with the Chevy Bolt, just not enough ways to charge it quickly when you're far from home. Then again, the "Destination Charging" network of stations is growing, detailed here, but such options are still much slower than Supercharging. See also Marc Benton's Tesla Model 3 vs Chevy Bolt - An opinion from someone who owns BOTH video. 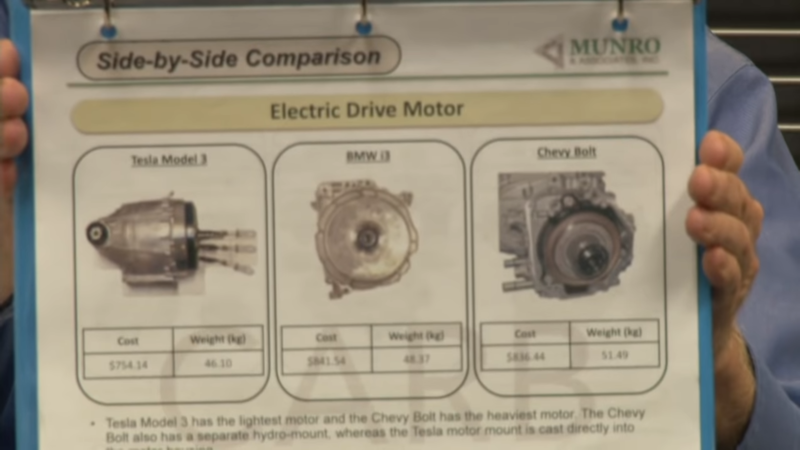 2006 Honda Civic Hybrid compared with 2018 Tesla Model 3 Long Range Dual Motor (AWD). Dec 23 2018, our 2018 Dual Motor All-Wheel Drive Tesla Model 3 and our 2006 Honda Civic Hybrid. H(onda): 177″ L x 69″ W x 56″ H. Source. T(esla): 185″ L x 73″ W x 57″ H. Source. H: 050 MPG - 050 city, 050 highway. Source. T: 116 MPGe - 120 city, 112 highway (29 kW-hr per 100 miles). Source is my window sticker. H: 110 hp (plus 20 hp for electric motor = 130 hp total). Source. T: 346 hp. - source. H: 123 lb-ft. (plus 76 lb-ft electric motor = 199 lb-ft. total.) Source. H: 0-60 mph 11.3 seconds, Quarter Mile 18.3 sec at 075.9 mph. Source. T: 0-60 mph 04.5 seconds, Quarter Mile 11.8 sec at 115.2 mph. Source and source. H: 15 in. rims, P195/65R15 89S. Source. T: 18 in. rims, P235/35YR20. Source. T: 1-speed fixed gear. Source. H: 60-0 mph in 124 ft. Source. T: 60-0 mph in 133 ft. Source. H: 10.4 cu. ft. Source. Note, seats don't fold down due to hybrid battery pack behind the second row of seats. T: 15.0 cu. ft. Source. Seats fold down, 60/40 split. H: 90.9 cu. ft. Source. Because the combined Cargo and Passenger volume is 101.3 cu. ft., the EPA classifies the Civic Hybrid as a Compact car, source. T: 97.0 cu. ft. Source. Because the combined Cargo and Passenger volume is 112 cu. 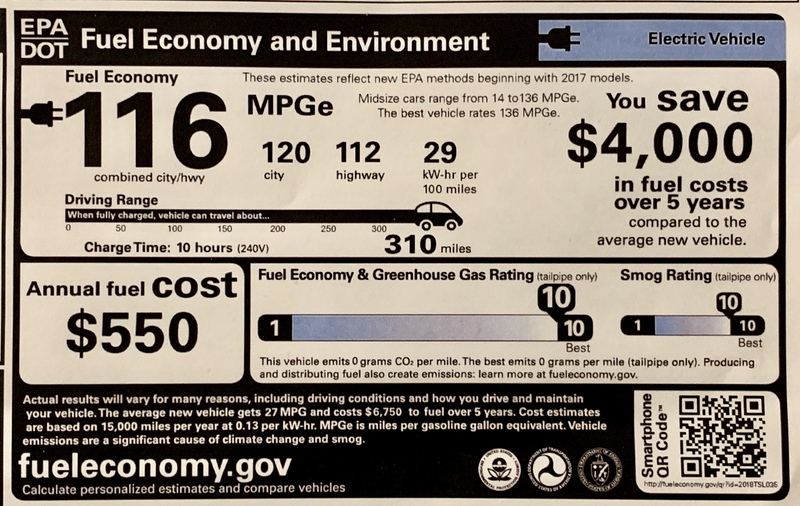 ft., the EPA classifies the Model 3 as a Mid-Size car, source. H: 39.4 in. front, 37.4 in. rear. Source. T: 40.3 in. front, 37.7 in. rear. Source. H: 51.9 in. front, 51.0 in. rear. Source. T: 53.4 in. front, 52.4 in. rear. Source. H: 42.2 in. front, 34.6 in. rear. Source. T: 42.7 in. front, 35.2 in. rear. Source. H: 53.6 in. front, 52.3 in. rear. Source. T: 56.3 in. 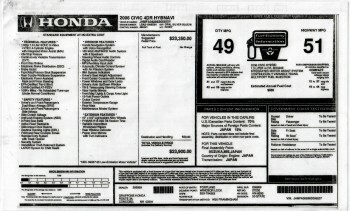 front, 54.0 in. rear. Source. H: Cd = 0.27 - Source. T: Cd = 0.23 - Source. Among the [top 5 most aerodynamic](https://www.motoringresearch.com/car-news/most-aerodynamic-new-cars-2018/) cars you can buy in 2018. H: 34.8 ft. - Source. T: 38.8 ft. - Source. H: Mostly 5 stars, details at Source NHTSA. T: All 5 stars, details at Source NHTSA for RWD, NHTSA testing for AWD not completed. H: $23,900 sticker, $37,366 total in 2018 (adjusted for inflation). As-delivered with dealer installed options, tax (exempt), and registration/title fees, ~$30,000 in 2006 dollars, which is equivalent to $37,366 in 2018 US dollars. T: $48,200 sticker, $52,582 total in 2018. As delivered with factory options, taxes, and registration/title fees, $60,082. The CT Sales Tax rate is 7.75% for vehicles over $50K, accounting for $4314.42 of that $60K, ouch. But we'll be getting a $7,500 rebate on our 2018 tax return. So total family outlay for this vehicle will be $52,582. 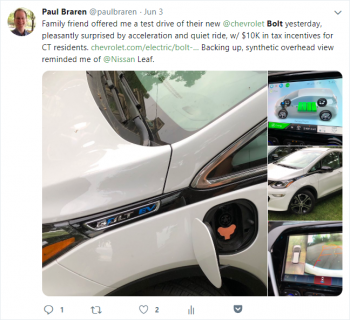 The $3000 Connecticut rebate for Battery Electric Vehicle (BEV) went away on Oct 14 2018. 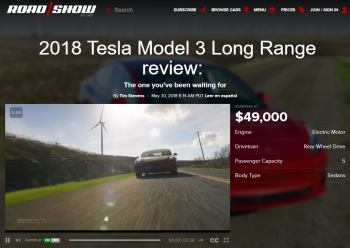 The RWD shorter range $35,000 Model 3 isn't expected until mid-2019, or thereabouts, details here and even more recently here. The Tesla Model 3, the less expensive smaller one. At first, I was a little afraid to publish this article. My thinking was along the lines of the potential backlash from my readers, purchasing what is perceived as a luxury car, who goes and talks about it online. But if you know me, you know I love to share my enthusiasm for tech. Yes, I'm blessed, I'm darn well aware of that. I thought about the virtualization and IT enthusiasts that I follow online, who I've come to trust. If any of them had published their all electric car ownership experiences, I'd certainly have read all about it, as I'm always curious about emerging technologies. Why wouldn’t I share the thrill of getting my hands on this marvel of technology, and all the tech behind it? Teslas sure are amazing examples of always-connected IoT (Internet of Things), rather expense thing. Then again, Tesla is getting very close to the average American car price. Still, this (low-interest, financed) purchase is quite daunting, and more than a little scary. By the way, even though they Model 3 is the smallest car in their current line-up, it's still a bit larger than the Civic, and certainly has a lot more headroom up front and in back. That glass ceiling is amazing, while managing to be strong enough to exceed roll-over safety requirements. Yes, I know there's a lot of stories about Tesla, long term viability, how it treats its employees, and how unpredictable and volatile Elon Musk can be, especially in the second half of 2018. I also know about some quality control concerns, as with any new car. I fully realize I'm likely to encounter some services annoyances, and maybe even the door handle issues some have reported when in icy conditions. But I'm rarely parked overnight outdoors in the winter. I'm ready to put up with some issues, and the overall experience of being in this car seems so worth it, based on the test drive experience I share below. Only time will tell if it turns out to be a good investment, and since I’ve gone public, you’ll be able to follow along. Here's the thing. I don’t currently see any serious alternatives. It's that simple. So "protesting" by buying some other a gasoline-powered car from another company isn’t going to do much good. I listen to a lot of podcasts, with many smart folks like Allyn Malventano of PC Perspective and Marco Arment of ATP (Accidental Tech Podcast), who openly say how they love their Model 3 and Model S Teslas (respectively). That's not to say their adventures haven't been without some problems, such as Marco having to wait for months for Tesla finance to clear up his lease issues, but that’s been resolved. Marco talks about his rationale here. He still very much loves his Tesla. FYI, Marco is also the developer/creator of Overcast app that I listen all my podcasts on, available on iOS, and I'll certainly be continuing to listen to such podcasts in my Model 3, with convenient steering wheel controls connected to my iPhone X Max via Bluetooth. Don't forget to also check out Fred Lambert's electrek podcast with the tagline "Tracking the transition from fossil fuel transportation to electric and the surrounding clean ecosystems." It's Fred whose referral link I used in haste when placing my order, but kicking myself for not giving Allyn's name instead. Safety, including recent report that it may be the safest car ever tested. Model 3 is now about 18 months into production, less early-adopter risk. Efficient and relatively green, although I fully realize some fossil fuel is burned elsewhere to let me recharge, just less of it. Still eligible for $7,500 tax credit through Dec 31 2018. Dashcam ability is built-in, just add USB flash, I'll give this one a try. Electric cars need routine service much less often. Incredibly responsive acceleration that generates smiles, at least for the driver. Elon Musk's online behavior this year. I live in Tesla-dealership-hostile Connecticut, which means I take delivery from Mt. Kisco NY, 79 miles away who kindly handles the CT DMV stuff for me. 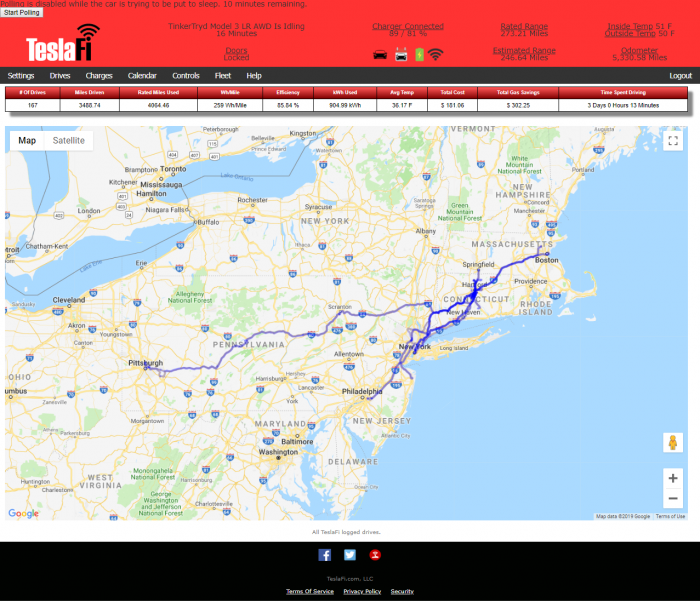 I'll need to get service from Tesla Milford, CT 44 miles away with loaner cars for the duration, or perhaps soon summoning a Tesla Rangers service van instead. 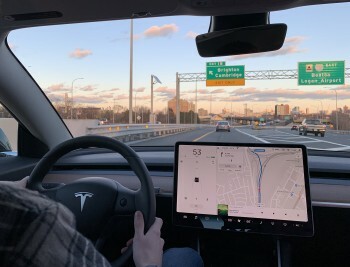 I live in Wethersfield Connecticut, right between Boston and New York, with a large number of Superchargers along the way for my many business and personal travels. 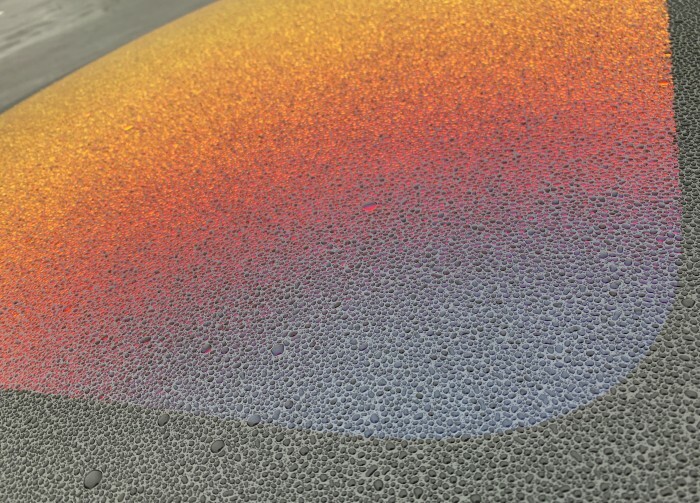 This makes an electric car a whole lot more viable, even in the hottest or coldest weather. How does a new car company handle orders, specifically, my order? How good is the delivery experience? Not too many car companies announced new features any old time of year via Twitter. Sounds kind of fun. Will there be more nice surprises coming soon? Bugs? Cloud issues/outages? It will take weeks to get an electrician to install a proper charging station or NEMA outlet in my home, given the amount of business the $7500 incentive has caused. i just used Tesla's Find an Electrician page and two days later, I already had a visit, now I’m just waiting for the free estimates. Q: How much faster is this than using the standard 120V outlets? A: The TT-30 outlets can supply twice as many amps as a regular 120V outlet. So your charging speed will be twice as fast. A: There are no warranty issues at all. Our adapter has the same internal circuit as Tesla's OEM adapters. 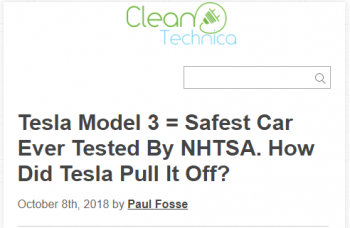 Additionally, consumer law protects you when using third-party equipment - so Tesla cannot refuse to honor their warranty due to your use of this product. Various sources seem to indicate that instead of 4 miles per hour max charge rates from regular AC outlets here in the US, this adapter should get me to 6 miles per hour of charging. 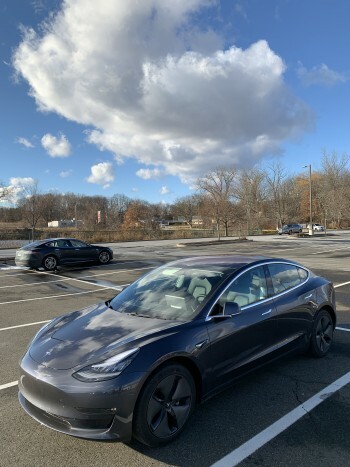 Dec 15 2018, West Springfield MA, at the Tesla Superchargers. Not many folks would make such a huge purchase without a test drive. What if it's scary to drive? What if I don't find the visibility to be good for my tall torso? I had a lot of questions. Only getting into one and driving gives such answers. Out of the blue, in mid December, as a pre-order holder, I heard from Tesla that test drives were being offered in my area on December 22nd. Sign me up, just in case we do decide to change cars around in my family, that was the thinking. I went in with the idea that perhaps someday I might be buying one. Little did I know just how soon that would be. To my surprise my wife was willing to tag along to check it out. I really had no idea she'd be on-board with actually buying one, but apparently the test-drive went well enough to consider it. A few days later came the issues with one of my son's car. It was suddenly time to get our known-good used hybrid over to one of my sons, driving it to new home town, as soon as possible. This changed everything. We were suddenly discussing not waiting for the shorter capacity $35,000 Tesla Model 3, which isn't due to arrive for at least another 6 months. These discussions were in depth, and happened over the span of several days. Sitting behind the wheel last Saturday at the Tesla Supercharger station in West Springfield last weekend, I immediate felt very comfortable. The steering wheel is slightly smaller than most cars, just like my Civic Hybrid. The large iPad-like display was easy enough to figure out, and glancing to the side slightly for a speed check was no big deal, as I was already used to glancing at the heads-up like digital display on the Civic. And Blake, my test-drive co-pilot, was an excellent at describing all-of-the-things, and handling all questions my wife and I pummeled him with. I learned a lot, driving around 15 miles during those exhilarating 30 minutes together. Why exhilarating? Not because I drove recklessly, I'm rather conservative, and I've gotten no speeding tickets for years. The thrill came from that profound sense that I was suddenly fortunate enough to know first-hand what it's actually like to drive the future. And it was good. The eye opening acceleration, only when demanded, was the most impressive thing I've felt on the road since I was 11, during a brief ride I enjoyed in a souped-up '77 Corvette. I still remember the g-force, and the ridiculous roar, and a bit of fear. None of that fear this time. Just a grin. The solid road feel that comes from a heavier vehicle with a low center of gravity is important. For me and my family, it's ALL about arriving at my destination alive, ideally with less stress along the way. It's just risk reduction assessment, analogous to the many risk reduction projects I've done as an IT worker, along with a bit of energy use reduction too. It doesn't hurt that occasional bursts of needed acceleration to merge into traffic is done with ease, without ANY of the usual throttle lag associated with any internal combustion engine powered vehicle. Nothing can change your life more suddenly than a car wreck, no matter who is to blame. I've been through some, and so has my wife. We were rear-ended by a drunk driver a month after our first new Honda Civic in the 1990s, with my parents onboard too. It wasn't good. Where possible, I prefer to increase our odds, all our odds, even if it means a huge stretch to the family budget. This may be my last vehicle. Because of my test-drive, my return window shrank from 3 days down to one. It's all spelled out in the Return Policy - Terms and Conditions. I realize a car is just a machine, and I can't let the obvious visual appeal cloud my judgment whether this car is a good fit for my family and I. Are the seats comfortable for long rides? Is the climate control good? We'll be trying everything, and gladly we have some hours of holiday driving ahead of us anyway. You've made it to the end of today's blog post. I still haven't told you which model and options my family chose. for those tid-bits, you'll need to wait until I actually pick up the car, which is actually happening tomorrow, December 23 2018! There will be many more posts about my experiences with this vehicle added right to this article, so come on back and revisit! The focus will be on my experiences using and owning the car. 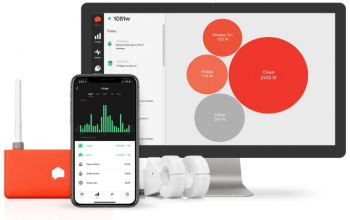 I also have a whole-home Sense Energy Monitor, along with the Tesla app, so I should get a pretty accurate look at what recharging actually costs my family. 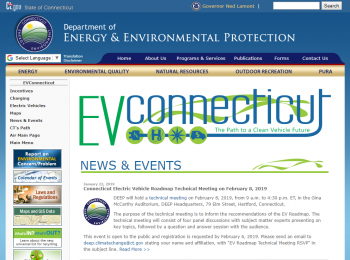 See also this Sense discussion thread about the challenges with detecting EVs. In a separate article, I will be covering Model 3 accessories, including a way to keep phones charging at full speed, and a way to charge both cradled phones even with the USB flash drive using up one of the two USB ports used by the dashcam. And finally, the ways I'll be keeping that winter muck from our shoes off the black carpet. Yes, we keep our vehicles a long time in this family, and we strive to keep up the value in our significant investments. I sure can't wait to take my wife and my sons for a ride today, and give them their turns, of course. I'll even have a chance to give my mom and dad a ride this Christmas! We’ll be starting out from the very same big driveway behind the house where I grew up, playing for hours on end with my remote control car. Guess what it ran on? Rechargeable batteries. Sound familiar? Family decisions made, it’s a go. Called my sales rep in Dedham MA to place my order, making a deposit of $2500 with a credit card. He placed the order with Mt Kisco location. 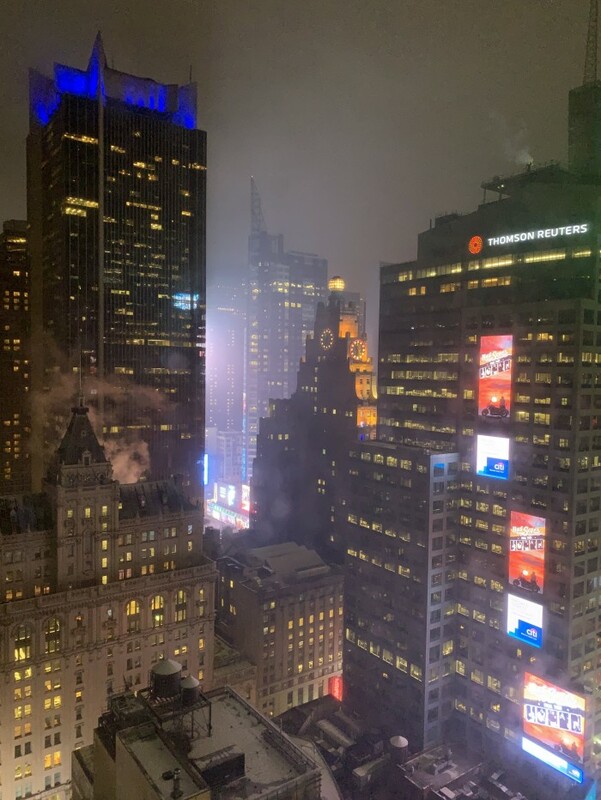 From my hotel room in New York City, I was able to finalize the pre-approved financing and request a check be mailed. I was also able get my VIN#, then tell USAA insurance that VIN, then upload proof of insurance. Nice to have all this legwork behind me, ready for a delivery date of Sunday, Dec 23rd. Tesla called in the evening, giving me answers to some Connecticut-specific questions that I may publish separately. I was also assured that my vehicle would be moved from Syosset NY to Mt. Kisco in time, routinely done by truck apparently. Tesla called this afternoon, at first I thought it was going to be bad news. The Mt. 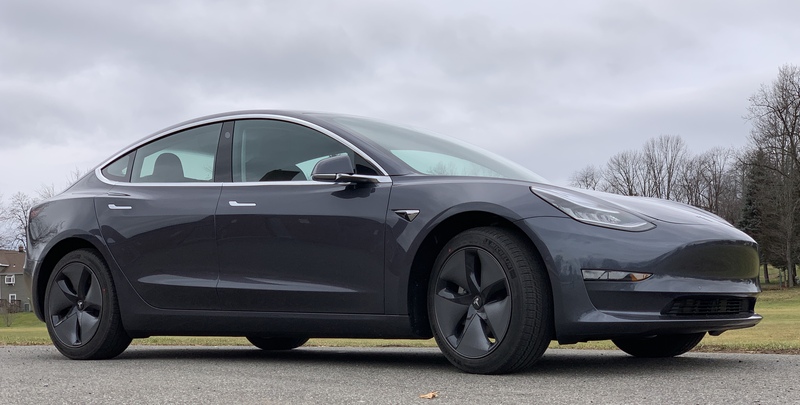 Kisco rep named Michael also had my insurer USAA on the line, to let me know that the original Tesla Model 3 in Silver with the options I wanted was still in Syosset NY, but not to worry, that they had found another VIN with just the right options. So a new insurance ID card was being uploaded into the tesla.com portal, to be sure the delivery still went smoothly. Yes, our car would be ready for my 11am Dec 23 pick-up. USAA is also my auto-lender by the way, beating Tesla's 3.99% financing. I chose a 6 year pay-off period, and thank goodness we recently got approved to help refinance our recently graduated sons' student loans at under 4% as well. Otherwise, this car purchase would have been a no go. Note odometer reading as I took delivery of the car on Dec 23 2018. Odometer 7 mi. date of manufacture Nov 2018. Yes, it's a new car! 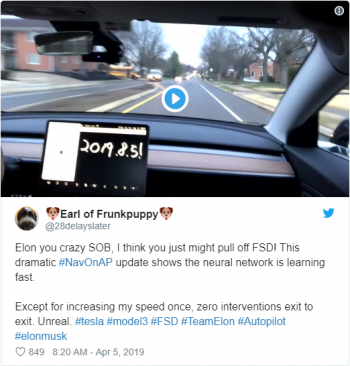 We knew the $5000 Enhanced Autopilot option could be added later (for $7000, or $5500 during promotional free trial periods), but all wheel drive and the extended range features could not. Delivery went smoothly, and everything looked good and worked well! This was definitely a good day. One of my sons, my wife, and I arrived at 10am, and we were greeted, seated, and waited on by 10:20am. By 10:45am, we were done with the minimal paperwork signing, mostly stuff having to do with disclosures and DMV paperwork, and we were soon walked out by another saleswoman to our fully charged Dual Motor All-Wheel Drive Tesla Model 3 by 10:45am. No issues with the vehicle were noticed, but the salesperson gave me her card just in case, to email her pictures of anything that might be identified later on. As for the dealership and delivery experience, let's just say it's an expedited process, in a fairly austere environment, with only about a dozen spots for deliveries to be made from. We had about a dozen other people in the small "dealership," and it only got busier the longer we were there. I'm fine with simple facilities, and avoiding the cost of a fancy dealership is fine by me, I don't plan to spend much time there anyway. Just one intersection away from the dealership, I found myself far below a traffic light, and just as I began to stoop forward to check on the traffic light's status, I remembered to simply look up. Love that always-on sunroof, the light was green, and I was good to go! The 80 mile drive home went smoothly, and it was fun to have a chase vehicle, as we got accustomed to the controls. Being a solo driver for delivery wouldn't be nearly as good, with my wife kindly doing the co-piloting duties during that first mission to arrive home safely. She even noticed that the tires were ranging from 44 to 47 psi on that drive home, took note to circle back and check on those again after an overnight rest in the cold. The door label says 42 I believe, then there's this tweet about comfort. It was mighty tempting to want to tinker with the screen more than focus on the driving task at hand, but as a team, we did very well, even during this first hour of unfamiliarity. Pulled into the driveway for the night, joined home's WiFi, then used the app to kick off the firmware update, which took under 1/2 hr from start to finish. Drove around 75 miles to family's houses today, including our first trip with 5 passengers. Everybody was comfortable, and headroom was more than adequate, including 2 6' tall males in the back seat. Even had a chance to give my late-twenties nephew a 2 mile turn, together. This was a fun day. As my sister and her daughters were checking out the inside of my parked car, they were asking what kind of engine is it. I popped the frunk (front trunk) with the app, and had them have a look for themselves. No engine. Later that Christmas Day, I had a chance to take my brother and parents out for a ride too, and my brother even had a brief turn behind the wheel. Future tests with my sister and 6'4' husband will need to wait for some other day. It should be interesting to hear their impressions about getting into and out of the car, seat height, and overall comfort. My wife was the first to notice one small issue with the car, a bit of condensation on the inside of the right front fog lamp. I emailed my sales rep at Tesla and included a picture, just to have the issue documented. I'm not going to bother with a service request for this yet, I'd like a bit more time in case something else gets noticed. Since charging at home isn't going fast enough to ensure a full charge before our trip to Boston on the 27th, it was time to head to the West Hartford Supercharger our first time there. Last night, at 34°F, I lowered the tires to 39 psi, to see if there's a noticeable difference on our big family road trips. Couldn't resist having a little fun late one night, with nobody around at Cumberland Farms. For some reason there aren't a lot of Teslas or EVs here. Hmm, a very bad idea. Where's the electron pump? 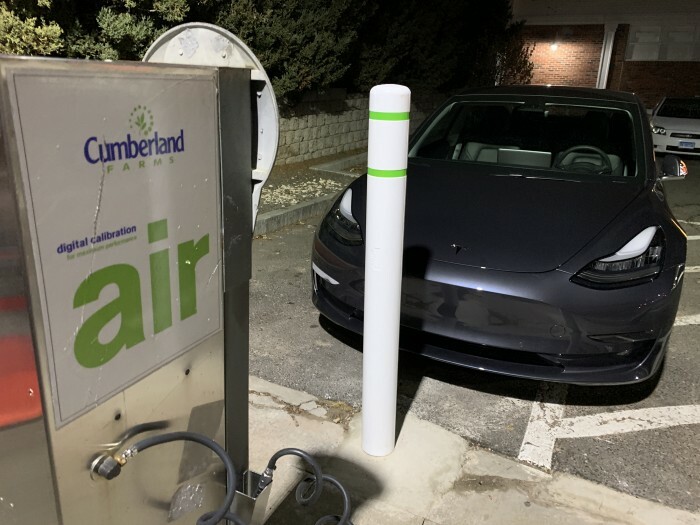 Turns out some Cumberland Farms have EV chargers, but not at this location. Oh, that's what I came here for, to adjust the tire pressure to 39 psi. Drove to Cambridge MA near Boston with family today, and back again, a 222 mile journey. No issues. With my Mom and Dad as copilots, luck would have it that we found ourselves in traffic right behind another silver Tesla Model 3, with some really distinctive Massachusetts EV plates. Second time I've spotted our same car in the wild anywhere. 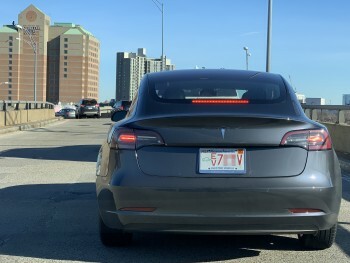 Very nice plates in Massachusetts, I do wish Connecticut had something like that. Still driving on temporary New York plates myself. We stopped by the Tesla Dealership at Prudential Center, just so I could see how my parents did getting into and out of the Model S. They actually had more ducking to do to get under the roof curve on the Model S than the Model 3 right next to it. Strangely, this location had no Model X. The trip all went very well. We departing at 9:30am with about 300 miles available range indicated, and arriving back home at 9:30pm with around 40 miles left, just as the low power warnings began. The temperatures stayed right around freezing temp all day, with a variety of 3 to 4 passengers total, and some use of seat heaters so my Dad could recline and snooze on the way back. That was an exercise in how smooth I could drive! Maximum speeds were about 68 mph, with most time spent between 50 to 65, with moderate city traffic those last 3 miles. Road comfort was quite good, enjoying conversation between the back seat and front seat passengers. There is still some road noise, but it's far less than any car we've ever owned before. Once thing we noticed is that the Tesla app on mobile shows the vehicles location and current speed. That's something to consider. Not an issue with key-card-only access. Headed to Tesla Supercharger behind Red Robin in West Hartford, CT again early this afternoon, to top off before heading down to Union Station in New Haven, CT with 4 passengers. There, I spotted another Silver Model 3 owner in the nearby parking lot, with a big grin as they spotted me too. Notice the orange cast to the roof's solar protection, it's only noticeable on rainy days. Having a sunroof in the front and the back has been a hit with the family. Our family drive to New Haven's Union Station was at night, in heavy rain and heavy traffic. This was a first time in adverse conditions. I felt quite comfortable as the driver, and occasional Autopilot tests proved it worked well even with low visibility. One thing we all soon noticed was that the windshield wipers set to "Auto" don't wipe fast enough, soon enough. As a workaround, I merely had to manually boost the speed occasionally, manually. There is no stalk control for this, close-at-hand on-screen controls only. This lack of proper rain detection is apparently being addressed soon, listen to the Nov 30 2018 electrek podcast at this spot, where a fix was estimated to be due by the end of December. So no biggie. Doing a lot of research on installing a Wall Connector today, with a quote pending. 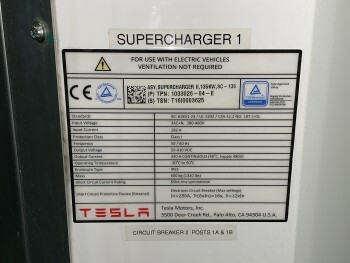 Leaning toward a 100 amp sub-panel installed in my garage, just in case there's another EV in my garage at some point in the (distant) future. Also looking at ways of using my Model S/X/3 Gen 2 Mobile Connector Bundle 20 foot cable, to get from where a sub-panel and 14-50 outlet(s) would go. 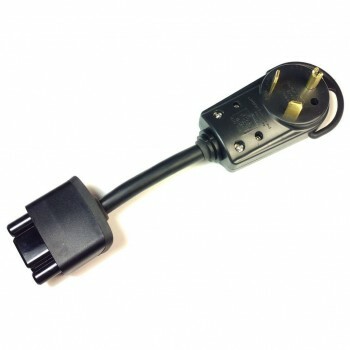 Seems do-able, and avoids the multi-week wait for the Model S/X/3 Wall Connector. Further investigation into charging options, including a look at 14-50 outlet(s) installed near my sub-panel. Extensive garage cleaning project, kicked off a week ago, continued. Got to be a back seat passenger today, and found myself very impressed with the height of the rear bench seat (raised 2 inches since the first Tesla Model 3 cars were made in late 2017). Between the seat height and the full sunroof, you really have a sense of openness, with a commanding view of everything around you. Despite the black interior, the feeling is the opposite of claustrophobia. Also had a chance to talk to fellow Tesla Model 3 Long Range owner Allyn Malventano, who advised me to not go to 100% charge routinely, along with a bunch of other wonderful electrical advise. Odometer 609 mi. (pictured below). My VIN# ends with 6 digits, 119XXX. 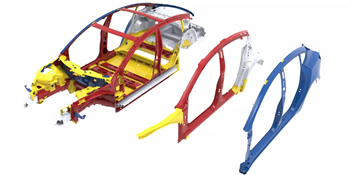 These indicate how many vehicles of this Model 3 were manufactured this year. Note that our Model 3 is in the one hundred and nineteen thousands, certainly not one of the first off the line. Also, it was manufactured in Freemont CA, according to Teslarati's Here's how you decode the Tesla Model 3 VIN. More work on my home's two car garage is coming along nicely, cleaning away 24 years of accumulated fossil-fuel-burning related stuff. As of 10:48am, I'm still unable to order from the Tesla Store, I suspect it's some sort of payment issue. This is my 3rd day trying. After 3 bids for the electrical work, this afternoon, I confirmed my chosen electrician that will be doing the install, and we agreed to have that work started this Thu Jan 03 2019. Jan 01 2019, heading up I-84 East toward Boston. Jan 01 2019, heading over the Charles River near Boston. Finishing up preparing the garage for the electrician's visit, weather in the upper 40s but sunny and windy, good enough to get some painting done. Another family road trip to Boston and back is planned for later today. Yesterday, I left the car charging set to stop at 250 of 310 miles range, to help with battery longevity. 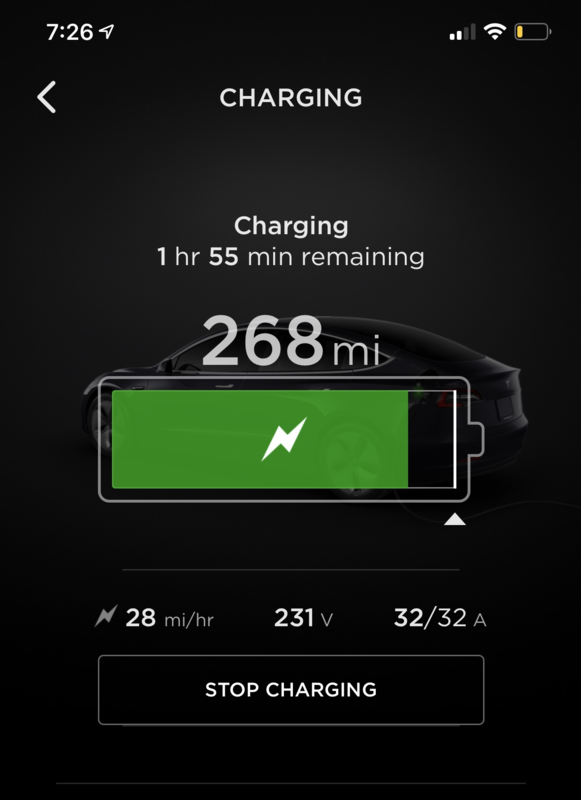 I had totally forgotten doing so might mean I wouldn't have enough time to get to full before this trip, since I only see about 4 to 5 miles of additional range per hour of charging from a normal 15 amp circuit. 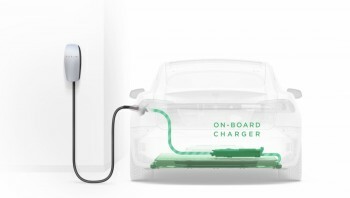 Having the ability to get a full charge quickly at home will be a much appreciated capability to have, glad that day is just two days away! Despite not having time to fully charge, the trip went very well. We left with 281 miles of range, arrived back home with 38 miles of range left. The weather was terrific for enjoying a back seat view out the sunroof as one of my son's drove, and the driving experience was great. We noticed that on the Massachusetts Turnpike, recently repaved areas exhibited far less tire noise than the still-smooth but older stretches of highway. Dramatically less. Driving back at night, we stopped at a Massachusetts Turnpike rest stop. Parked by the convenience store entrance, with my wife on the phone, a Massachusetts State Police Trooper gently knocked on her window. I rolled it down, he simply asked if our plate was temporary, and how many days were left until it expired. 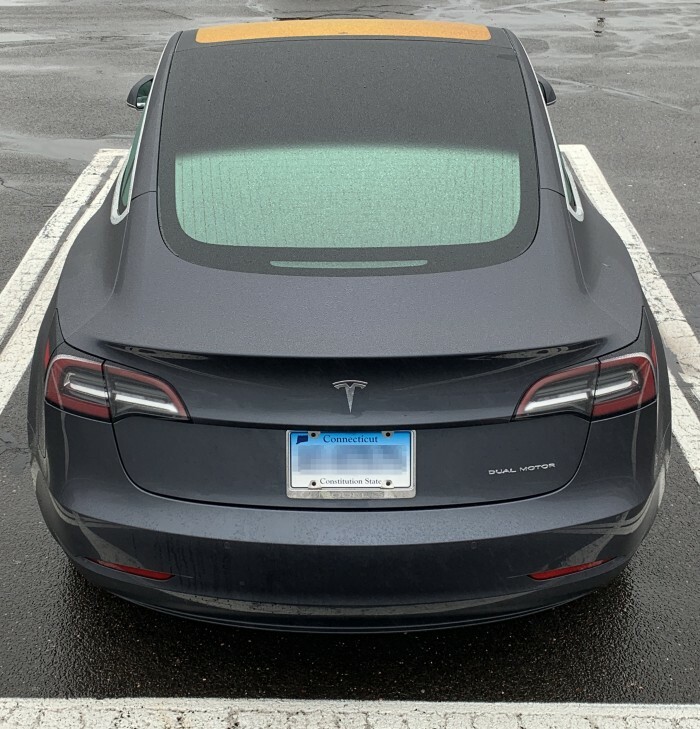 I explained that the temporary plate was good for 30 days from my Dec 23 2018 delivery date, and that the New York Tesla dealership told me it could take nearly 30 days to get my new Connecticut plates in the mail. That was it, it wished us a Happy New Year, and we were on our way. I'm thinking perhaps the strangeness of having my plate in a cheap plastic frame in the plate area, instead of taped to the instead of the rear window, is what caught his attention. No big trips planned for today, just more garage cleaning and household chores. Accessories shopping still underway, as well as some returns, I plan to publish details in a separate article. Unfortunately, the electrician called, regretted he had to delay the install date to Monday Jan 07th, which is fine too of course. Garage is now ready, with thick plywood now painted and ready for the surface mounted panels and conduit. Luck would also have it that I'm on a podcast tonight live tonight at 9pm ET, talking about various TinkerTry tech updates, but I'm guessing we'll also be talking a bit about this car too. 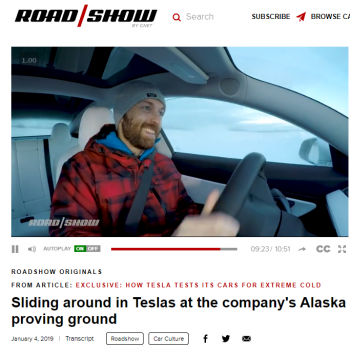 How very timely, given Jim Collison also have a 2006 Civic Hybrid, and was just recently talking about various EVs on his recent episode with Mike Wieger at this spot, full shownotes and subscribe buttons at Pimp Your Christmas Lights with xLights, Is Rivian a Tesla Killer and a New Monitor – HGG381. Specifications comparison section and accessories section added to the article above. Refined specifications sections for legibility. Came across the spectacular videos about the 11 speakers of my premium sound system, part of my Premium Upgrade that I needed for Long Range. That explains why I came to tears when I sat alone in the car one night to really try the sound system out, and the bass started, and it was good. Very good. Check out Does Tesla Model 3 Have Best Sound System? The sound may even be better than the Model S or Model X, watch and listen for the reasons why. TAVA YouTube Channel: Why is the Tesla Model 3 Sound System So Good?? Today, my wife and I played around with the fireplace (easter egg), which gave us a good laugh. 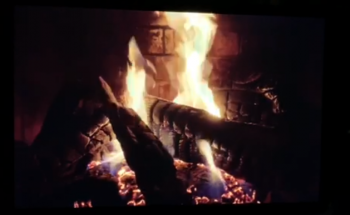 Especially once we tapped the screen, then discovered the realistic flames were now accompanied by a love song, and what seemed like warmer air coming from the vents. Nice touch! These are the biggest grins I've ever seen from this journalist originally from Engadget, but now clearly enjoying driving and writing for CNET at Roadshow. He also happens to be a long time ice racing enthusiast, from nearby Upstate New York. Who better to take the Model 3 out for a "spin"? Click to view the whole article featuring a full transcript and video. It's got more responsiveness than any other all wheel drive car on the road, really, because there's no differential that you need to worry about, clutch plates, or a viscous center diff, or anything like that that needs to adjust. Basically they can adjust as much power to the front or to the rear as they want, pretty much instantaneously. And as a bit of a differential nerd as I am, the potential here makes me pretty excited for something like ice racing, where you really need a lot of quick power shifts to be able to get the car to do what you want it to do when you want it to do it. And this is such good fun I cannot begin to tell you. 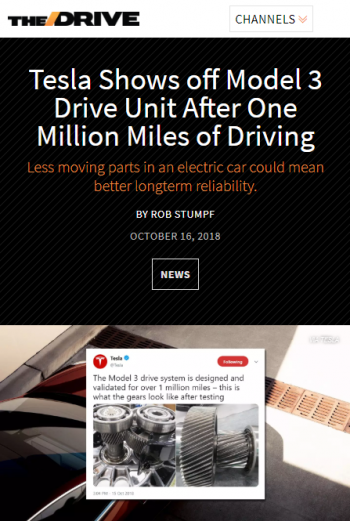 [LAUGH] Now granted this isn't the kind of thing that your average Model 3 owner's going to do, but uh, it sure is good to know that you can. And again I can still feel the car doing some work to help me. It's still doing some breaking across the axles to help the car pivot. And it's still doing some work to help again make sure that I'm keeping in control and not getting too far out of the line. But again it's letting me do what I want to do, and the car is doing what I want it to do. And that is beautiful. But at the end of the day I am incredibly impressed. If you've read like coverage of the Model 3 you I haven't always been in this car biggest fan but to be able to do a skin and even flick like that with the traction control on that's pretty special stuff. Yeah I wish I could turn everything off without having to rely on an engineer with a laptop. And yes, if you're driving these cars in the cold, you will lose some range. But if you're a Tesla owner and you put your car up for the winner, you're making a terrible mistake. 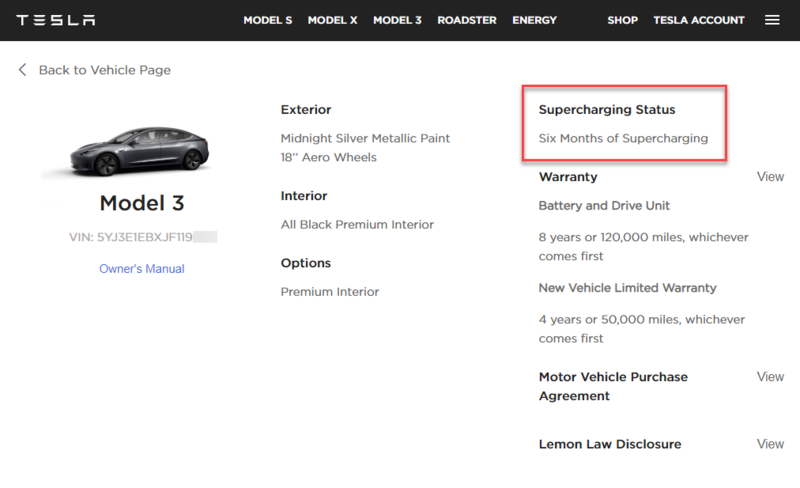 Also noticed that my Tesla Account's Vehicle page shows my Supercharging Status as "Six Months of Supercharging" due to my mention the referral code when placing my order. See also this Tesla forum thread Account finally changed to free unlimited supercharging. Took my parents to my sister's concert, and some ergonomic issues did surface, with my Dad having a bit of a hard time getting in the back seat in this smallish car with a sloping roof line. He also struggled with the seat belt latch a bit. Getting out of the vehicle required some reminders too, with the window button often hit instead of the door open button. Not a big deal, just things to be aware of. Today, noticed that the front passenger window was down about an inch when we were about to back out of a parking spot. Not sure if it was user error, but I think this may bf the second time we've seen this. I'll keep an eye on this. 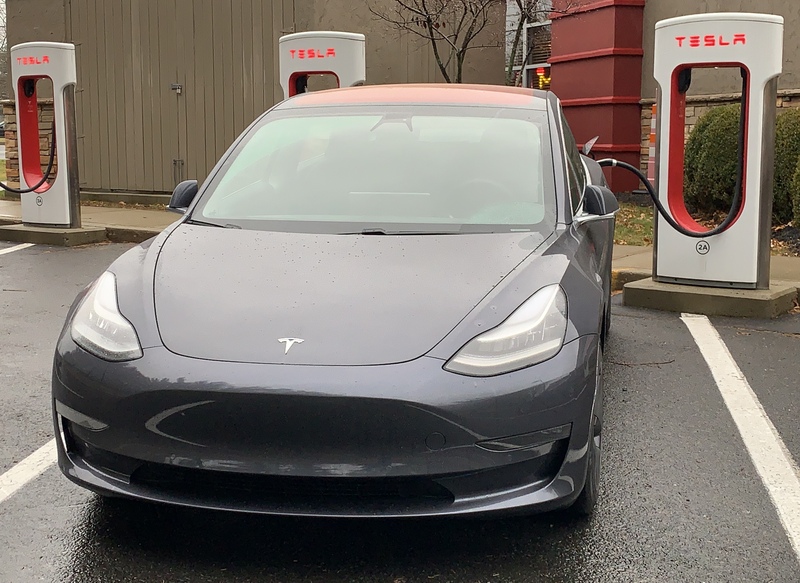 Later today, I also spotted a Tesla Model 3 Performance version in red in Rocky Hill, CT, and another Tesla Model 3 charging behind Panera Bread in Wethersfield, CT. 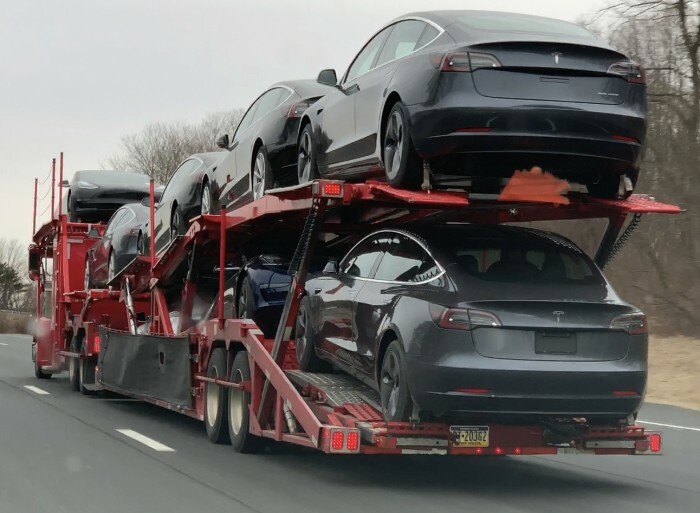 The elated driver and fellow Connecticut resident said he took delivery just 3 weeks ago in New Jersey. He absolutely loves his Model 3. Then had to hurry off to his waiting family, but not before letting me know I could charge if I wanted to. Very considerate! I noticed my wife had a brief struggle latching her front passenger seat belt, something about the angle, but puffy winter coats don't help. Again, not a big deal, she and I certainly quite enjoy driving around together these past 2 weeks. Finally, as others have noticed, when driving around 40 mph with very strong cross-winds today, I noticed a bit of wind noise was apparent from the inside, mostly from the top of the windshield. This might be reduced with the RPM Tesla Model 3 Wind Noise Reduction Kit. Or it could be just that there is so little engine noise, such wind noise is more pronounced on such EVs. I won't know more until I get a chance to test later in January 2019. Tomorrow, my electrician arrives, and I'm rearranging the cable modem and UPS below my 200 amp service panel to make space. for the generator transfer switch he's also installing. Elliott Bell from BCL Electrical Contractors worked diligently from 9:30am to 6pm to complete all specified work, which I'll hopefully have time to detail in an upcoming article. Turns out he knows fellow Electrician Christopher Hing from Elite Electrical Contracting, LLC, but Elliott was available to get the work done a bit earlier, here's my HomeAdvisor review of his work. Both of them are extremely well rated on HomeAdvisor. If you're living in Connecticut in area code 860, I expect you'll be happy with either of their work, I just can't speak to Chris's work first-hand. Getting the full 32 amp charging rate that I was expecting, this is good! Note that I don't normally charge to 100%, and that the end of the charging tends to take longer. Later this evening, I headed out to get some quick dinner at D'Angelo with my wife, and that's when I noticed some strangeness with the Phone Key, which toggling Bluetooth or rebooting my iPhone X Max didn't fix. Used my key card instead. I also vacuumed up, removed all floor mats, and placed these new floor mats in, no clips required. I'm much happier with these, details here. I'm seeing the full 32 amp charge rate I expected with my Model 3's Gen 2 charger on a shiny new NEMA 14-50 outlet. This is good! Especially since I'm headed to Boston again later this week, in the cold, with some garage parking. No more worries about whether I'll get to 100% on time. Drove a bunch of errands in crummy, rainy, foggy weather, again felt nice and safe. When getting in to drive away, I was prompted to use my key card to be able to drive away, with my iPhone as key not working. I remembered this when parking at Lowe's, and noticed no horn chirp to indicate automatic locking as I walked away. So I used the app to manually lock the car when parking there since the proximity automatic lock wasn't working. I scheduled the upgrade for 4pm while parked and plugged in, and on WiFi. The car took care of this upgrade for me from there, uneventfully, this is good. Here's the 2018-50 discussion on reddit, Tesla Forums, and Tesla Motors Club. 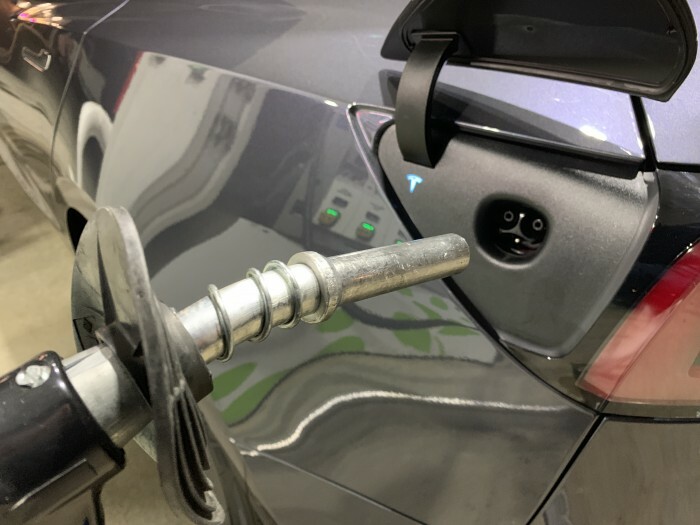 It seems to be a minor release, mostly about this issue, Tesla releases software update to help unfreeze charge port. No apparent changes noticed during my driving this evening. I decided to go ahead with seeing if I could fix my phone as key issue by using Lock menu in the Model 3, removing my iPhone, then re-adding it again. All is well again. Older son arrives home, to drive Hybrid to my other son the next day. Installed RPM Tesla LEDs, bright, nice! Installed carbon fiber center console wrap, too about 40 minute, easy enough. The Honda Civic Hybrid makes it to its new home in Pennsylvania. Drove to Boston today for a flight from Logan Airport, pushing my luck with 17°F temps. We’ll see how this goes! We set out with 307 miles of range indicated (full charge), but I made the mistake of not warming the car up for a while while on the charger in my garage, given I was parked overnight on this 20°F night. Near Boston, we parked our Model 3 in a garage that has no chargers, knowing I could Supercharge on the way home if need be. 08:38 am - 163 mi of range indicated, 25°F ambient temperature. 09:19 am - 162 mi of range indicated, 26°F ambient temperature. 05:43 pm - 159 mi of range indicated, 24°F ambient temperature. As for the Honda Civic Hybrid, we head straight from airport to a license plate place, handing the title transfer and new plate. 02:13 pm - 144 mi of range indicated, 28°F ambient temperature, snowflake indication shows up, the cold battery warning. This rather rapid vampire drain really caught my attention, I should have paid closer attention to my son's warning about third party apps affecting the battery charge. I logged off the Remote S app around noon today, and it seems to have reduced the drain, evident with dramatically less battery charge loss seen below. 04:24 pm - 136 mi of range indicated, 27°F ambient temperature. 09:46 pm - 136 mi of range indicated, 26°F ambient temperature, started driving home. As we got back to our chilly Model 3, the door handles were a little crunchy, with a little ice apparently in there, but we had no issues opening the doors. The Tesla Navigation to "Home" warned us to stop at a Supercharger, but I wanted to see what it would say if I removed the charging stop. It said to stay under 65 mph if we wanted to make it to our destination. Given the cold temperatures, this was not true, we wouldn't have made it home regardless. 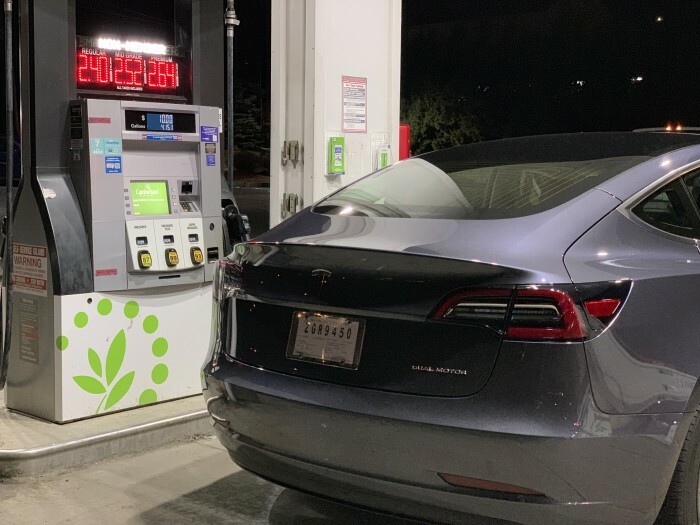 We decided to stop at the Framingham, MA Supercharger for 22 minutes, from 10:18pm to 10:40pm. This moved us from 105 miles to 148 miles of range left, while physically 88 miles away on a very cold 18°F (-7.8°C) night. That means we should have arrived with 60 miles left, at least in normal weather. We also received some low tire pressure warnings on the left rear tire showing 39 psi, and the others at 41 psi, common for outdoor parking in very cold weather. I'll probably go with 42 psi when back at home, using my garage's new tire pump, to avoid warnings in the future with this compromise between economy (47 psi) and comfort (39 psi). 12:04 am - 19 mi of range indicated, 18°F ambient temperature, as we arrived home and plugged in. That's just 6.1% of battery left. 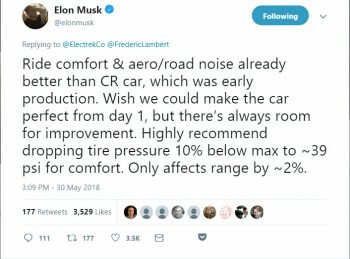 So in hindsight, we should have Supercharged longer, to avoid going below 10% of battery capacity, or is that 20%, discussed on Tesla Forums here. 09:07 am - 267 mi of range indicated, ~25°F ambient temperature in our garage, after charging at 32 amps overnight. It's very good to know that we can fully charge overnight right here at home, and that our investment in the install of the NEMA 14-50 outlet was worthwhile. What else did we learn about long distance winter travel? That we're real glad we went with the Long Range model! Winter seems to incur roughly a 33% penalty on range, at least with interior heat at 68°F. Honestly, my Honda Civic Hybrid also suffered pretty poor mileage in the deep of winter too, roughly the same degradation actually. Extended travel at under 25°F will incur roughly 33% battery range loss. Each day about 20 miles of range lost with 3rd party apps running, in sub 25°F temps. Each day about 6 miles of range lost with 3rd party apps logged off, in sub 25°F temps. All these lessons learned will come in handy, for when I head back to Boston's Logan Airport again Monday January 21st. Guess what temperatures are predicted that day? High of 13°F. and low of 6°F. Ouch. I might want to look into using one of Logan Airport's charging stations, signed up for ChargePoint already, just in case. 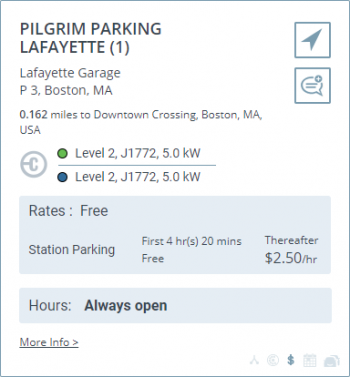 Also good to know that VMware Boston's LaFayette Garage has a ChargePoint Charging Station. My Model 3's new CT License plates arrived today, that's 22 days after taking delivery in Mt. Kisco NY, about as expected. Very nice to not have to go wait on line at the Wethersfield DMV! In temperatures below 40° F (4° C), use washer fluid with antifreeze. Not using antifreeze can impair visibility through the windshield. 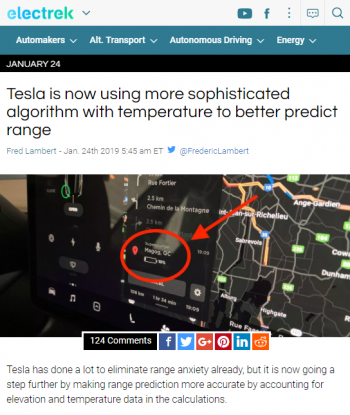 even more detail at Tesla's Preconditioning in Cold Weather article. Clean looks, a distinctive yet practical interior layout and solid performance create what seems like a perfect package. In this clip, you'll see some pretty bold moves that highlight just how well the traction control works, even when in slip start mode, even on a single motor / rear wheel drive Model 3. Yes, he floors it, in the snow. He also mentions ABS pulsing, which I've never noticed in my Dual Motor / All Wheel Drive Model 3, but I haven't driven in the snow yet. 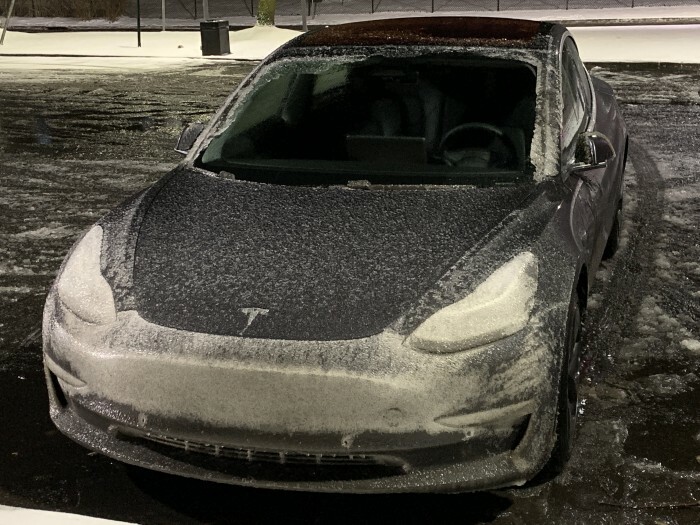 Tech Forum - Fun with the Tesla Model 3 in the snow [with Slip Start]! 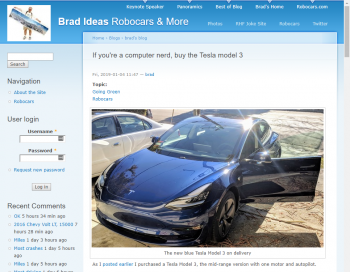 Tech Forum - Tesla Model 3 is at the body shop! I've used the PlugShare (iOS and Android) and ChargePoint (IOS and Android) apps to help with planning my trip to Boston's Logan Airport this Monday, increasing the odds of finding a charging spot to park our Model 3 for 3 nights. This Monday, Martin Luther King Day, is predicted to be a very cold, not uncommon in the dead of winter here in New England. Image from forecast.weather.gov Hourly Weather Forecast Graph for Boston, Logan International Airport MA, Last Update: 7:38 am EST Jan 17, 2019. Teslanomics with Ben Sullins - Honest Tesla Model 3 Review 6 Months In. Car has been set to charge to 97% overnight. I'll also be moving to 100% about an an hour before we set out for the 107 mile trip to Logan Airport tommorrow, while also enabling the climate control, much like this tip on reddit, which includes a link to bemental_'s amazing Tesla Shortcut. One of my sons found this great video, enjoy! Andy Syle - Tesla Model 3: Top 20 Tips & Tricks! Hartford CT at 5:05am is -3°F. -3°F shown on my Model 3 display at 7:17am. 06:30am - Charged to 309 miles indicated range, with 0°F temps outside and about 15°F temp in the garage,after also pre-warmed the car for over an hour. We drove 110 miles of mostly highway driving with one brief stop, parking at 9:12am. The ChargePoint signage at Logan Airport Central Parking 6th floor Southeast corner was a bit intimidating, and my family didn't really want me to plug in, given any chance of being towed, even on this very cold day. So we parked in the marked electric spot nearby, with no power, with the car indicating 120 miles of range left, but zero degrees ambient temps in the garage. I logged all 3rd party apps off, to maybe reduce vampire drain. 10:05am - 118mi indicated battery range on Tesla app. 01:43pm - 118mi still indicated since car fell asleep at 10:05am, and couldn't get a newly updated figure. Warming up a bit, slowing losses. Your Enhanced Autopilot trial has now ended. To continue experiencing our most advanced driver assistance features in your Model 3, you can purchase Enhanced Autopilot via the car’s touchscreen or through your Tesla Account at any time. This upgrade is currently available to purchase at the reduced price of $5,500. One week after your trial, this price will return to $7,000. Please be aware and cautious once your trial ends as all Enhanced Autopilot Features will be disabled. The Traffic-Aware Cruise Control feature that comes with the trial will revert to standard cruise control and will no longer automatically adjust speed based on traffic. is the strongest up-sell-iest part of the feature set, as even modest Toyota Corollas have adaptive cruise control these days, which they call the Dynamic Radar Cruise Control System. Many other cheap cars have it too. Yes, I sure wish at least the Traffic-Aware Cruise Control was available to all Tesla Model 3 owners, and yes, it works particularly well. I'm certainly glad that I was able to try Enhanced Autopilot out these first 5 weeks of ownership. 09:42pm - 101 mi. - 43.7°F outside, range actually went up from low of 88 mi. just from the temperature rise, remember the car wasn't plugged in. 10:27pm - 099 mi. - Started the Model 3 and left Logan Airport Central Parking, stopped in Cambridge, MA, and decided together we could safely make it to Auburn MA instead of Framingham MA Supercharger, partly to check it out for our first time there. Took some 4K video of the facility. 11:46pm - 027 mi. 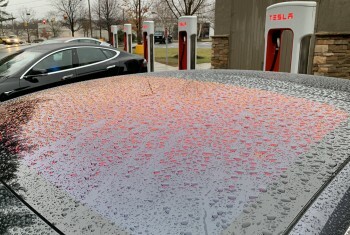 - As we parked and started to charge at the Auburn MA Supercharger. 12:16pm - 215 mi. - Unplugged from 30 minutes of Supercharging, and set out for 65 more miles to home. Temperatures climbed, predicted range actually improved. My flight was 3 hours delayed, landed at Logan Airport at 9:26pm, and had some stops. This meant time to Supercharge, we went for Auburn MA, and in 30 minutes, we had far more than enough to make it home. Went to Cambridge MA today for a family related trip, stopping at Framingham MA and Manchester CT Superchargers along the way back for some shopping, taking some 4K footage and photos of each facility too. I have been dabbling with TeslaFi.com, a website that has no app, includes a huge amount of information. 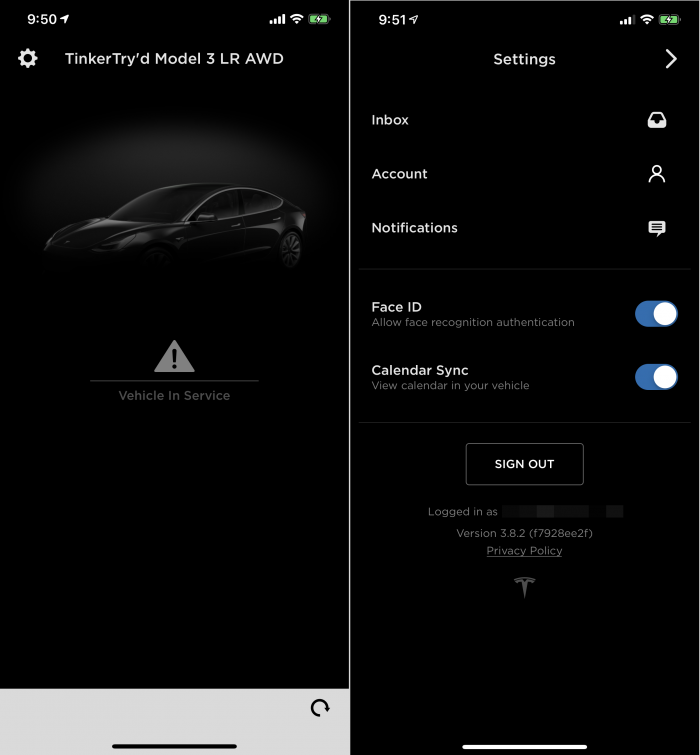 Not comfortable with providing My Tesla Account credentials with any 3rd party, I used Windows Tesla Auth Token Generator to provide TeslaFi a way to see my vehicle, then turning on TeslaFi Sleep Mode. 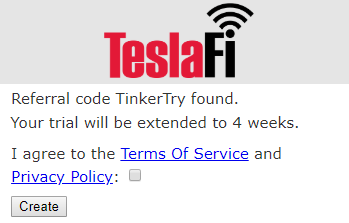 You can get going with a free 14 day trial by setting up a TeslaFi account using the TinkerTry referral link. I also finished up the cable routing around my Wall Connector with 14-50 Plug, and am happy with the 40 amp charging speeds. I came across a good (albeit older) article with an intriguing overhead picture, seen below. With just a few days left of the discounted Enhanced Autopilot trial, there were serious discussions about whether it was worthwhile. 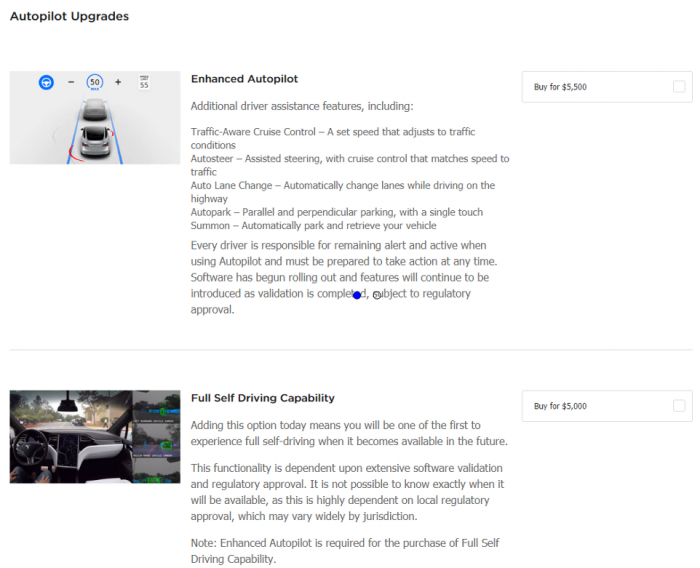 We opted to get the Enhanced Autopilot, and once purchased in the Tesla Store. We haven't decided on the value of the now-$5000 "Full Self Driving Capability" option, which will likely cost more later, it's not clear cut, read more at arstechnica here. I drove 368.48 miles today, a lot for one guy in one day. It's part of my job, and I need to say I felt a lot safer getting that transport job done, and more relaxing overall. It was a great opportunity to test of efficiency and range on yet another cold winter day, and a chance to really try out Enhanced Autopilot in stop-and-go 20mph traffic. 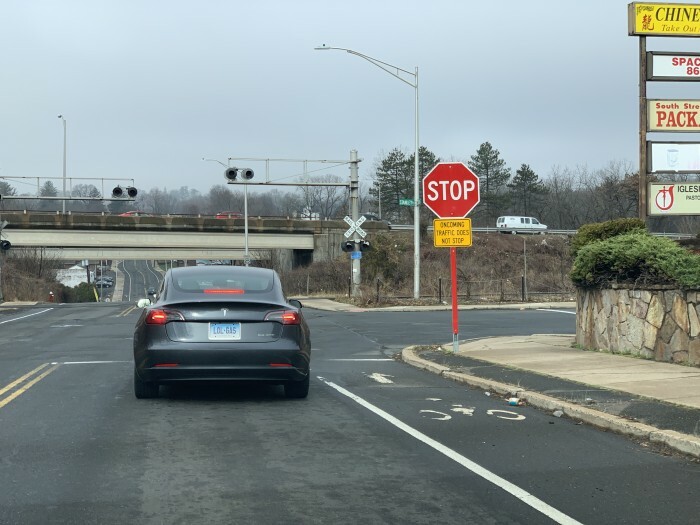 It worked well, with only a few odd behaviors noticed that were never dangerous, such as the Model 3 deciding to stop a lane change when already straddling the dashed white lines. Not a problem, nobody was around. 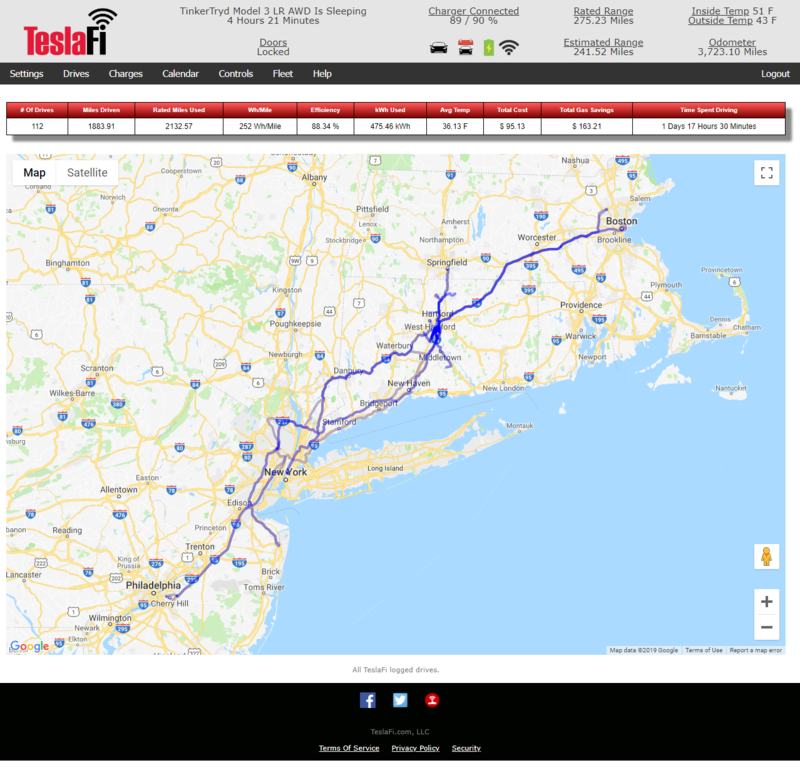 TeslaFi really helped me track my moves and my Supercharger visits, and I continued to record footage of my experiences at the Edison NJ and Danbury CT Superchargers. Your right, I didn't really have to stop twice, but given it's free for me these next few months, it sure made more sense to take a food break at a Supercharger than anywhere else. Also kind of funny, the location in NJ, you know, the whole Thomas Edison thing. It sure seemed appropriate that the high voltage lines were evident (almost) above the Edison NJ Supercharger, note that this is near Menlo Park NJ, where Edison's home and research labs were located. This evening, during some windy cold weather, the power in our home had some brownouts lasting about 10 seconds. This stopped Supercharging, which is fine by me! UPSs on all computers and internet modem & router kept things healthy during those events. Guess it's good I have a whole home surge surpressor that handles everything in my home, via the 200 amp service panel. But that doesn't help with brownouts, which can do bad things. Gladly, everything seems fine. I have reached out to Tesla Support, and was directed to an agent who gave me the following clarifications regarding “Full Self Driving Capability.” These are not official Tesla responses, provided here for informational purposes. If you have questions, you should directly contact Tesla for the latest information. I asked if Autopilot 3 (HW3) hardware always be available to Autopilot hardware 2.5 (HW2.5) owners like me, and the answer was yes. $5000 option. There is no time limit as to when it will be available on tesla.com, and it will include HW3 hardware and software. As for exact timeframe, and how much earlier folks who pay now will get their upgrades then, that's unknown. 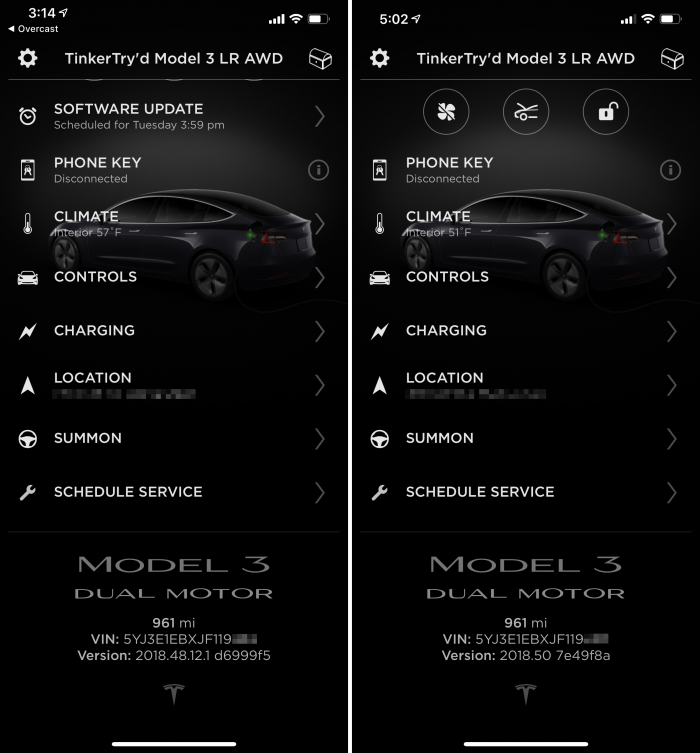 All Model 3s compatible with the HW3 upgrade will be eligible for the FSD platform. My electrican visited again, finishing up the minor change my town's inspector suggested, everything is all set now. Extremely cold temperatures predicted tonight into tomorrow, lows of 2°F and high winds, so my garage will likely dip to around 12°F. I'm keeping my Model 3 at 90% charge today. In case a long drive this weekend is needed, I'll do what I did yesterday in preparation for that 368 mile day. On my Model 3's screen, I scheduled it to charge about 2 hours before I was set to leave, then I changed the charge limit from 90% to 100%. In the morning, about an hour before departing, I also turned on the interior climate control too. Looking at the data in TeslaFi, it's seems this "preconditioning" helped make that drive quite efficient. 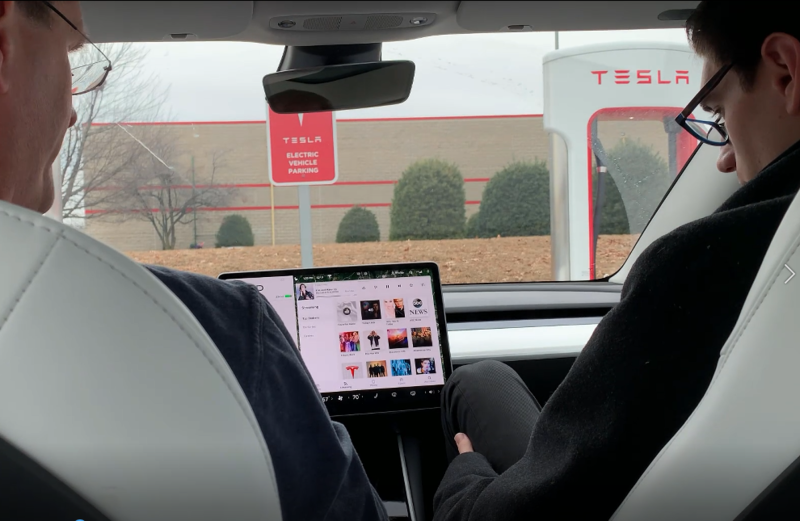 Basically, you use the Model 3 browser to play Spotify from your phone over Bluetooth, and it works! How? No worries about data, it's very lightweight, it just tells your phone what Playlist or song to play via tiny API commands. All the heavy lifting of streaminig or downloading of songs is done on the phone's data plan, and the music is sent to your car via Bluetooth. tap on "Click To Login to Spotify"
I too had a Volt and when the lease ended, I got a Model 3. I got AWD so I could use it to go up to the mountains, where AWD is required to avoid chains on days with weather. I had been borrowing my wife's Audi Q3 for that, but she was turning it in on an Insight. I really liked the Volt, especially when it was on electric, so knew I wanted to head in the electric direction. What I didn't anticipate was how much better I'd like the Model 3 than the Volt. 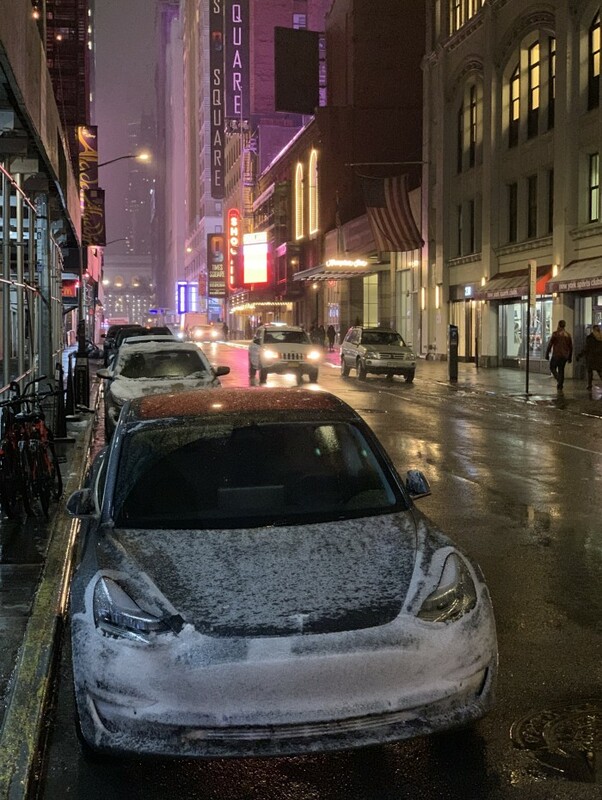 My experience in the snow with the Model 3 (multiple weekends in some pretty impressively bad conditions) has been excellent. Also came across some videos you may also find interesting. Marques Brownlee - Let's Talk About Tesla "Killers!" Just be sure to turn on the basic sleep settings or it will keep your car awake. I have sleep mode enabled with 12 minute "Time to try sleeping" and 10 minute "Idle time before trying to sleep". model3man - Someone Killed My Model 3 - but we're uninjured! Gur814 - Which Tesla Model 3 Options Should You Buy? 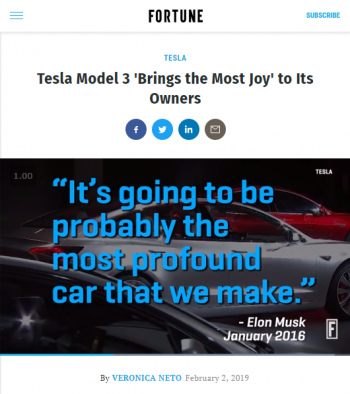 Consumer Reports then listed the 10 top vehicles in a list that appeared to “bring their owners the most joy” (an ode to Marie Kondo) with the Tesla Model 3 coming in first place. 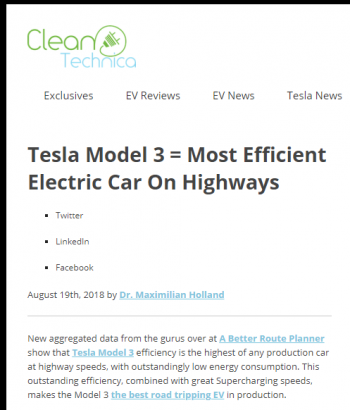 The all-electric vehicle beats the Porsche 911, which Electrek reports has been repeatedly the most-loved car by its owners. 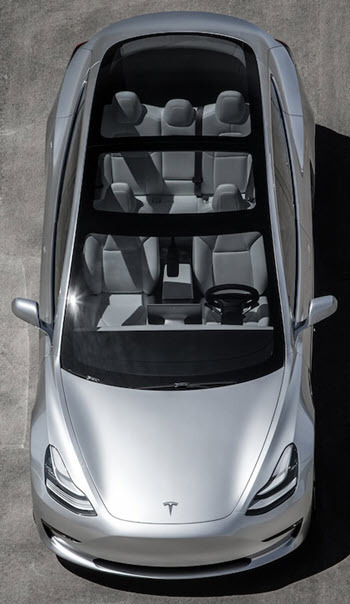 Tesla’s Model S also came in fifth place. On the main streets in my town, I recently realized that i was initially fooled into thinking that they added those grooves to not just the center double yellow lines, but to the side solid white lines. Why? Because of the vibration the Model 3 adds to your steering when when it detects your right-side wheels are on the line. Yes, it simulates the wheel shake so well it seems like the pavement has texture. It's just Tesla doing their thing, even when you're not in any kind of cruise control or Autopilot mode. It's like lane assist, without the actual assist. It's their lane departure warning, kind of like the taptic engine feedback Apple uses with their trackpads. Just another pleasant realization even many weeks into driving around. Subtle and effective. Despite the over-the-top, link-baity title, there is some good information in this video. Bottom line, for now, if you're parking in a higher risk area, consider using the frunk or even your covered sub-trunk to stash your valuables while you're away. Vehicle Virgins - A HUGE PROBLEM WITH THE TESLA MODEL 3!! Yet another magic moment in the Tesla ownership experience today. I finished my shopping at Home Depot, returned to my Model 3, and was going through the small bag of electrical items I had just gotten. I turned on the interior light to the left of the rear view mirror. As I put the bag away, I was about to reach up and turn off the dome light. I figured I'd not bother to turn it off, just to see if it would do that for me as soon as I put the car into Drive. Sure enough, it did, with a nice smooth dimming. Delightful, just another example of an extreme attention to detail. I know these little things sound like they don't really matter, but in aggregate, they do. This is promising, Tesla's attempt to shake things up in the automotive repair industry. Impressive. 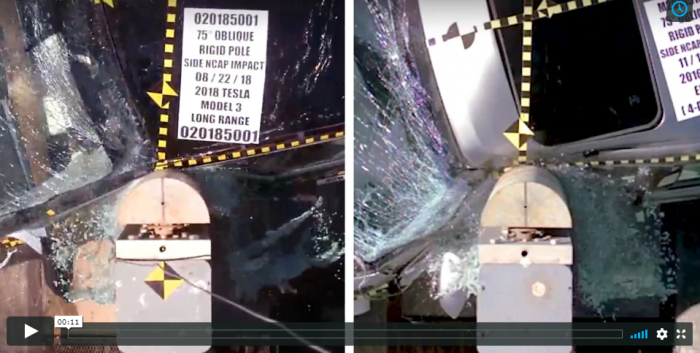 Like Tesla - Our Model 3 Crash & 24 Hour Turn Around! 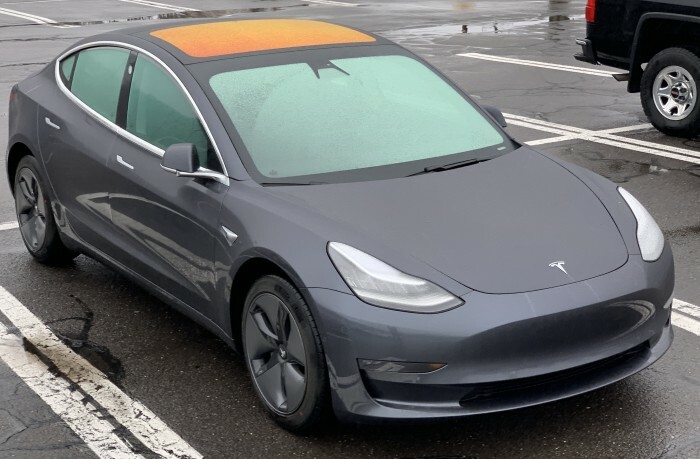 Also learned 7 minutes into that video that Light Silver was discontinued back in September of 2018, but after seeing it in person at the Auburn Supercharger, it is a little too light to hide winter salt mess. For England, it would seem that something right between Light Silver and Midnight Silver would be ideal. 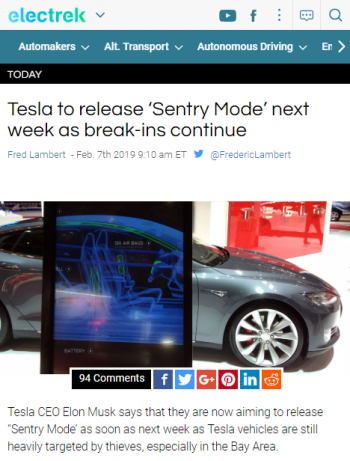 Tesla CEO Elon Musk says that they are now aiming to release “Sentry Mode’ as soon as next week as Tesla vehicles are still heavily targeted by thieves, especially in the Bay Area. Over the past few months, Tesla vehicles have been subject to a series of break-ins and owners have been trying to find solutions. Same idea, different implementation, I'll add whichever ones I like to my every growing Model 3 Accessories article. It's been a few weeks since I've driven my parents about. This time, I had door stickers installed, but even so, with no prompting or guidance for me (intentionally), both of my parents still opened the window instead of the door on their first pass. They also failed to remember to push the door open after pressing the correct release door button. Later on during our return journey, everything went smoothly, including less fumbling to find and click in their seatbelt latches. I have not had the time to watch this whole video yet, even sped up a bit: I need to get my tax preparations done, including filing for that $7500 federal deduction. You can check out some of the comments on reddit too. But already, some segments caught my attention and had me dropping back to 1.0x speeds, here's my collection of highlights for starters. Engineering - Sandy Munro was asked from engineering point of view, how would he rate the BMW i3, Chevy Bolt EV and Tesla Model 3? Here's the video segment, queued to just the right spot. They have...the best electronics designs, the best harness design...drives like it's on rails...everything...apart from the skin is brilliant, I think it's brilliant. Cooling - Next up, the discussion about the unique cooling system. Yes, the super bottle, handles both AC and battery cooling duties, it's truly a unique Tesla design. Screen grab from "Autoline Network - Sandy Munro's Tesla Deep Dive - Autoline After Hours 447" on YouTube. Sandy Munro is a straight-shooter, and pretty much craps all over the Model S and Jaguar I -PACE in this discussion, engineering minds are likely to enjoy it. He has some pretty strong criticisms for the Tesla Model 3 as well, so don't listen if you prefer to believe the car is perfect. The Tesla Model 3’s system, though, is different in that it packages two pumps, one heat exchanger, and a coolant control valve all within the bottle itself. There are tons of videos with tips for driving EVs in the winter, but they take time to watch. It’s very old-school of me to use all these words. I have condensed what I have learned so far in videos, and in my own driving in the Boston area. I’ll update as I go — add your comments. I hope this is helpful. For long road trips, even in the middle of winter, this video points out an interesting possibility. Next week, I have business trips to southern NJ, NYC, and greater Boston planned, so that'll be nearly a thousand miles in all. The plan is for it to be uneventful. 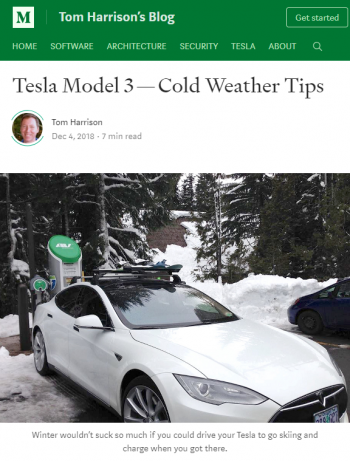 Teslanomics with Ben Sullins - Tesla Winter Driving Secrets! Like Tesla - Tapping Into Tesla's Hidden Range! 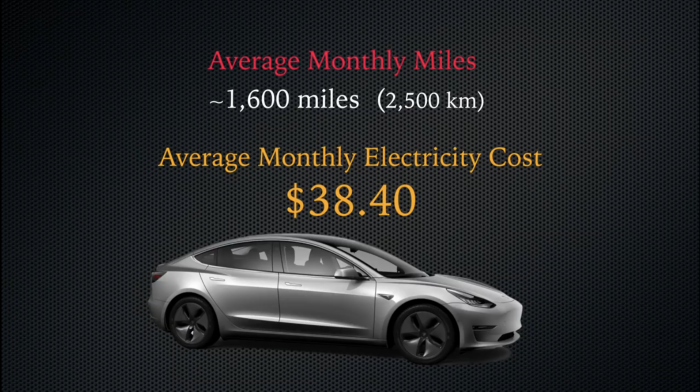 Tesla Model 3 driving 1,600 miles per month costs $38.40 in Georgia. 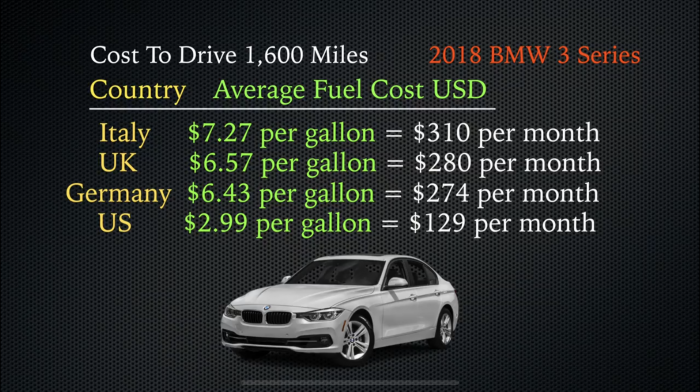 BMW 3 Series driving 1,600 miles per month costs $129.00 in Georgia. That's at Georgia's 10 cents per kWh. Here in New England, it's more like 17 cents, but even still, that's well under half the cost of gas per mile. Spent some time with family this weekend, and shuttled 5 of us to an event in comfort, with the center rear seat occupied by a nine year old. 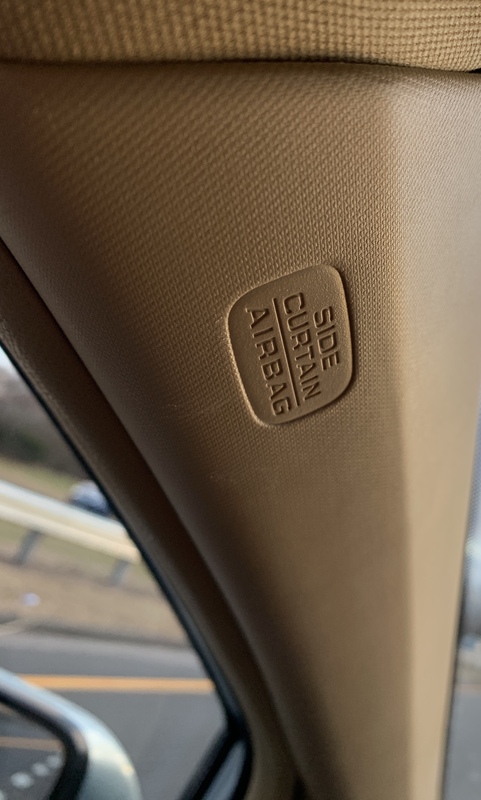 One thing that helps is to ask everybody to consider putting their bulky winter coats in the trunk, which makes getting seat belts latched easier too. A relative spotted the Model 3 in when she parked behind it, came inside, then asked if that electric car was mine. I asked her how she knew it was electric, and was expecting an answer along the lines of recognizing the T logo for Tesla, but the answer was much simpler than that. "No tail pipes." Ah, yes, both simple and true! Tomorrow, getting my wife to work in the morning, in 4-6" of snowfall that's expected overnight. Then an evening 200 mile drive to NJ. Yes, this electric car doesn't get coddled: it's our daily driver. On another topics, you may want to hear about the process of Tesla software version releases, and some bumps in the road that early adopter's feel the most. 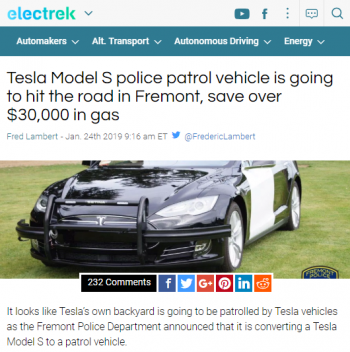 Tesla Raj - Feb 17 2019 - Did Tesla Squash the Bugs? 2019.5.3 review. As for me, I'm still waiting for 2019.5.3. Now that I know the blind spot detection still isn't there, I'm even more glad I have my low-tech blind-spot mirrors, described here. I have about 900 miles of road ahead of me, this upcoming Tuesday to Friday. No car is perfect. Maybe you've also heard about delays in repairing busted up Teslas. Here's a set of two videos that go over MKBHD's first-hand experience. Marques Brownlee - Feb 15 2019 - Apollo is Back - My Tesla Repair Process! Here's some video about the improvements to Autopilot. Finally, ending on a more fun note today, there's this video, with a fun title and a bit of over-the-top commentary. The Money Guy Show - Nov 12 2018 - 9 Tesla Magic Tricks Every Owner Should Know! If you're interested in what one creative YouTuber is doing to deaden sound at higher speeds, subscribe to his new SD Tesla channel, where he's also looking into Front License Plate brackets. Actually subscribing makes all the difference in encouraging folks like this to keep on doing it, I know, as my early years on YouTube were really rough. I love his all-in approach. He even offered anybody who buys a Tesla through his referral link a ride in his Roadster, if he wins one. Here's just one of his videos with a self-proclaimed clickbaity title: he really loves his car overall, and he also chose the Nomad Wireless Charger for Tesla Model 3. Also spotted many great tips in this helpful video. Andy Slye - Jan 18 2019 - Tesla Model 3: Top 20 Tips & Tricks! One that is particularly useful is to use the right scroll wheel to remind Autopilot you're alert, rather than a wheel-wiggle that might be disconcerting to passengers. What's really nice is that he also has all his video's great tips right there in the YouTube video's description as well! Feb 21 2019, Milford CT Supercharger. I wound up stopping roughly half-way at the Connecticut Post Mall Tesla Supercharger in Milford CT. When a mall based location has all mall facilities closed at 10pm, I did have to make a short walk to Dunkin Donuts for a beverage and bathroom pitstop. Then I recorded another video overview of this Supercharger facility in 4K of course. After 31 minutes of Supercharging, and a quick touch-less car wash at Mobil across the street to get some of the salt grime off the car for better visibility, I was on my way again, having been off the highway for just 40 minutes in total. This worked out just great, and the rest of the drive was rather easy. Finally a moment to write up how this 900 mile week really went. In a word, very well! Now for some of the details. My Model 3 is not coddled, it's my daily driver. It has to handle inclement weather. Wednesday Feb 20th wasn't exactly great weather, so I waited until traffic and freezing rain had mostly ended before heading into the New York City for work meetings the next day. It was quite the adventure, and the timing of my events meant no Amtrak this time around. There were zero hair-raising moments, and only one momentary side slip that got my attention as the rear end slid about 3 inches to once side, no problem, things straightened right out quickly. That's it. The rest was routine cruising. 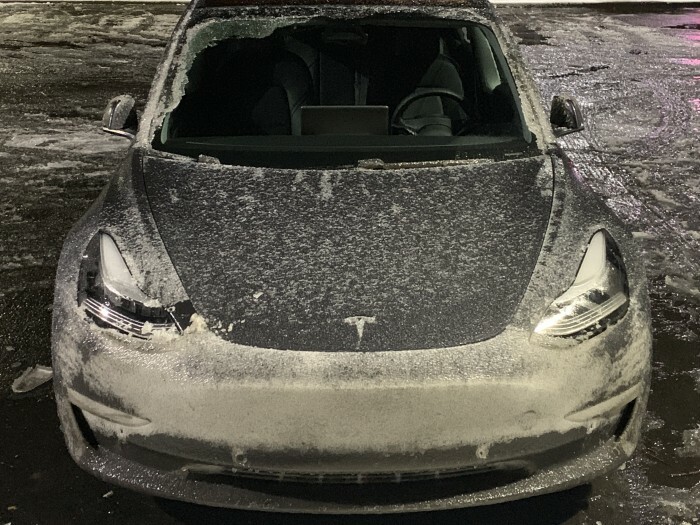 A safe, uneventful 3 hour drive that should have taken 2 due to slow speeds, and a remarkably thick crust of ice across the whole front of the Model 3 that collected. So thick that some of my left headlight reflected back at me somewhat if I sat up tall. These weren't exactly normal driving conditions, but I was most definitely relieved to have 4 wheel drive! White Plains NY Mobile rest stop on Feb 20 2019 at 9:44pm. Time to stop and clean the headlights off. Arriving in Times Square at 10:46pm. Arriving behind Hilton Times Square on 41st, for valet to garage park. I just came across this video below today, and I wasn't even looking for it. 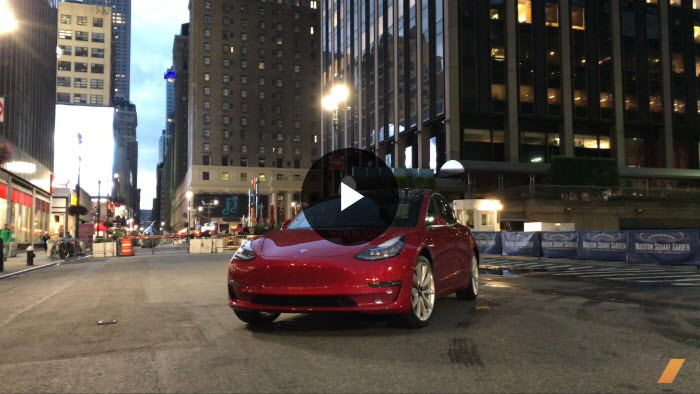 It features a Model 3 driving from Penn Station NYC to South station in Boston, without stopping to charge. It was done in October with warmer weather. For me last week, I had no choice but to Supercharge en route. Why? When planning my NYC to Boston trip, I couldn't find solid information on where I could park near my Times Square hotel and charge. Ideally, self-parking in a place where I could safely leave my Model 3 for 20 hours, and have it fully charged for my 8:30pm to 1am drive to Boston. I'm a bit of a night owl and prefer to drive when nobody else is around. Also, Acela didn't have anything that seemed to work for my tight schedule on this particular trip, would have certainly been far more costly, and would have had me arriving in Boston even later on this already short night. What the video fails to mention is the cost of Acela versus the cost of driving. 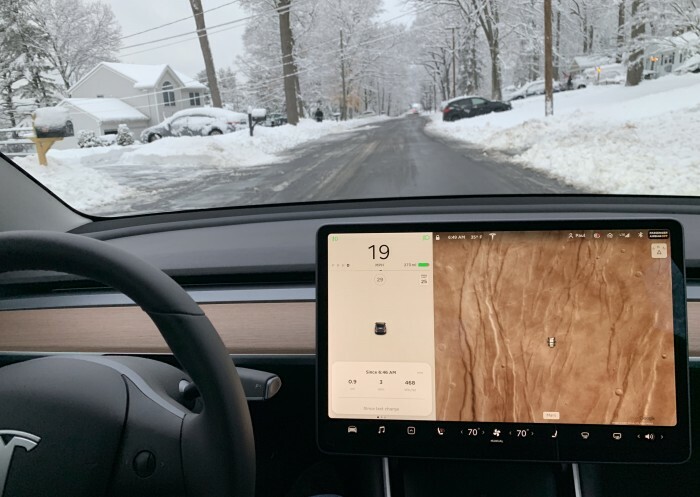 I think you'll find the efficiency seen in my TeslaFi report below to be pretty remarkable, especially since it's winter! I'm still in my first 6 months, so I still have free Supercharging, so the "Cost" column is really an estimate of what my Supercharging costs would be. Click the screenshot above to get started with TeslaFi. TeslaFi - You can get 30 days free free, or 14 days free using the non-affiliate link. For the access token TeslaFi requires so it can get data from my car, I avoided sharing my Tesla.com credentials by creating this token on my Windows system with the simple and free Windows Tesla Auth Token Generator, and steered clear of the "Enable Controls" option in my TeslaFi account. For Mac OS and iOS, you can give Tesla Token a try. 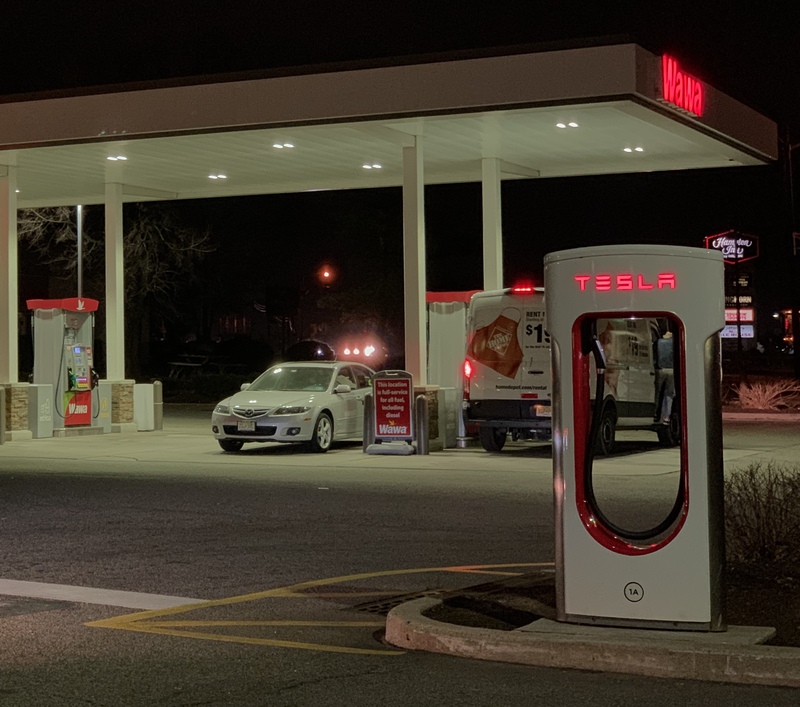 My TeslaFi report, Feb 24 2019, Times Square to Milford CT Supercharger. Pilgrim Parking, Lafayette Garage, Boston MA 02111. Click to view Google Map directions, since ChargePoint doesn't currently support direct links to their charging stations. I had meetings at VMware in Downtown crossing, and conveniently, the Lafayette Garage below VMware has 10 EV parking spots right next to the elevator, with 4 ChargePoint chargers. Perfect! I chose to overnight park there instead of at my nearby hotel, this worked out well, allowing for an easy run to Logan Airport to drop a colleague off, then straight home, with no need to stop to charge on the way. 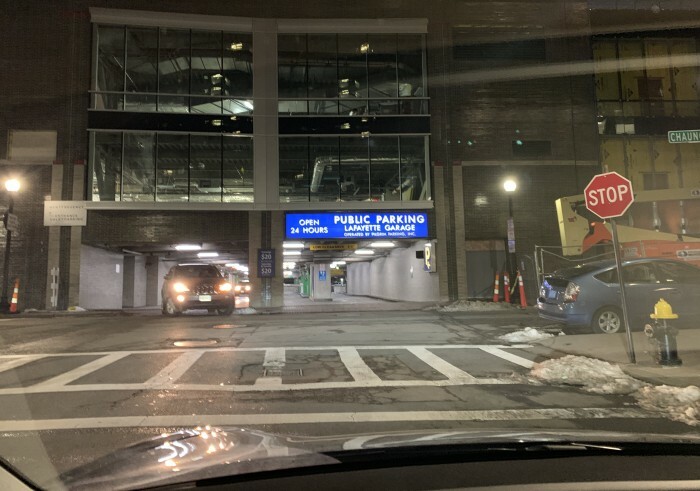 Lafayette Garage, Downtown Crossing, Boston MA, 1am Feb 22 2019. Four ChargePoint chargers. Filling my tank of electrons took about 13 hours and $21.55, plus the garage's $40 parking fee. In hindsight, I could have stopped charging several hours earlier and moved my car to a charger-less EV spot to save perhaps $10, with enough charge to make the cold 120 mile trip to the airport then home without stopping to charge. The image here shows my Sense Energy Monitor at a particularly busy moment, with a nice way to visualize the relative power use of the biggest devices typical in our home. I won't really know how this will look when the AC turns on this summer, but I'm confident my EV charger outlet electrician did things right. 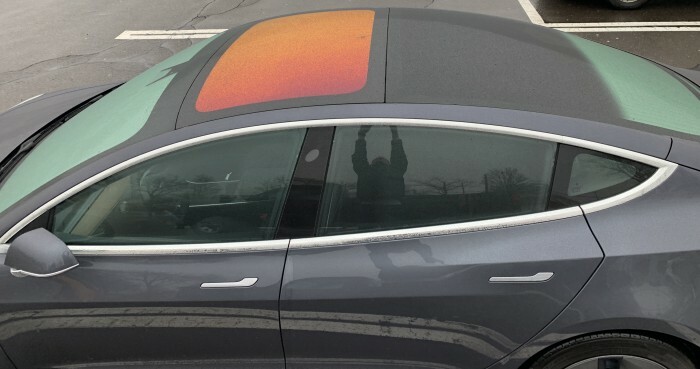 As I returned to my Model 3 after finishing my supermarket shopping, the colors of my giant windows was rather apparent. The fog on the windows really accentuated the look, which I found rather startling and kind of fun. FYI, these iPhone XS Max photos have only been cropped, but are otherwise unchanged. I love data, and I'm now quite fond of TeslaFi. You can see I've gotten around quite a bit since I began running TeslaFi 4 weeks ago, on Jan 27 2019. Which Tesla Model 3 vehicles are eligible for CHEAPR? 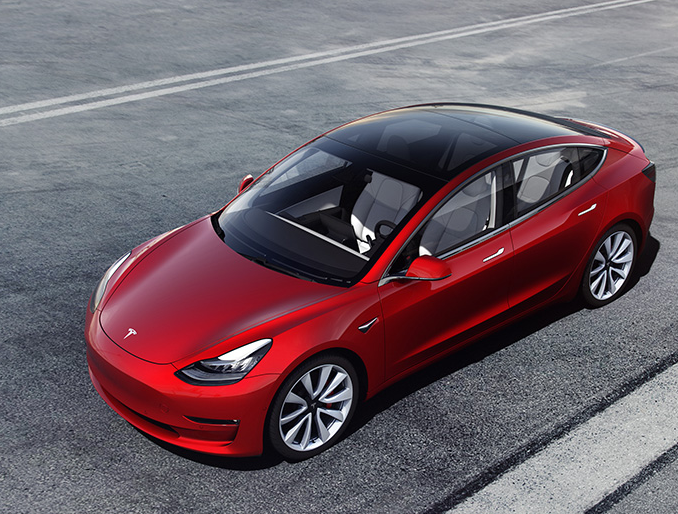 After February 6, 2019, the Tesla Model 3 Mid Range Rear-Wheel Drive and the Tesla Model 3 Long Range Dual Motor All-Wheel Drive models with an MSRP of $50,000 or under are eligible for CHEAPR. The Tesla Model 3 Performance and Tesla Model 3 Long Range Dual Motor All-Wheel Drive models with MSRPs that exceed $50,000 are not eligible. The Tesla Model 3 Long Range Rear Wheel Drive has been discontinued by Tesla. This information reflects MSRP pricing as of February 6, 2019 and is subject to change. 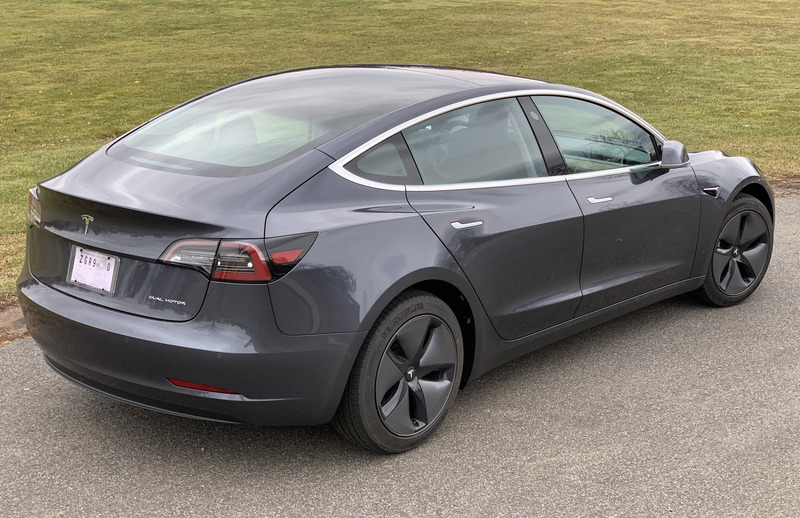 From October 15, 2018 to February 5, 2019, the Tesla Model 3 Mid Range Rear-Wheel Drive and the Tesla Model 3 Long Range Rear-Wheel Drive were eligible for CHEAPR. 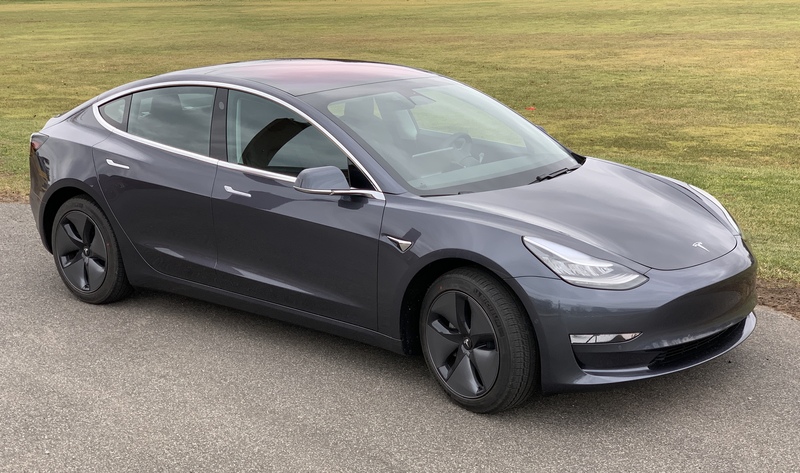 The Tesla Model 3 Long Range Dual Motor All-Wheel Drive and Tesla Model 3 Performance models were not eligible because the base MSRP of each model exceeded $50,000. This information reflected MSRP pricing as of October 22, 2018 and is subject to change. Before October 15, 2018, the Tesla Model 3 Long Range Rear-Wheel Drive and Model 3 Long Range Dual Motor All-Wheel Drive models were eligible for CHEAPR. The Tesla Model 3 Performance model was not eligible because the base MSRP of this specific model exceeds $60,000. Filtering for my town of Wethersfield CT zip code 06109, I can see that so far, there were currently only 5 Tesla Model 3 owners who received a CHEAPR rebate. Also, today I spotted this fascinating video below. Enjoy! If you want to slow down playback, no problem, use Video Speed Controller Chrome Extension. After making some good points about how sensationalist local news is funded (hint - car dealerships), he also challenges watchers who have never driven in one to ask themselves if they've ever heard Tesla owners saying this thing is a rip off. Good points! The Money Guy Show - Nov 5 2018 - Top 5 Tesla Ripoffs! I decided to try this Manhattan garage out that offers charging, here's how it went. Drove from home in Wethersfield CT to Pittsburgh PA and back this weekend with my wife, that's about 485 miles each way. This brought our Model 3's odometer from 4,018 on Fri Mar 1st to 5,010 on Sun Mar 3rd. The trip was uneventful, which is of course what you want. Charging proved to not really be much of an issue, needing food and bio breaks every 2.5 to 3 hours anyway, and doing a bit of shopping at the various stops on our weekend date together. I've included a screenshot below of a particularly efficient segment, a mere 226 Wh/Mile. Not bad for a 36°F evening! That we drove 1,000 miles in a weekend and didn't arrive back at work Monday morning exhausted is remarkable. A remarkably efficient hour of travel, a mere 226 Wh/Mile! My lifetime driving map so far, as of March 14 2019. Woke at 4:45 am to a snowstorm wrapping up, had about 8" to clear with the snowblower so my wife could get out of the driveway by 6 am. Then I found that there were no Ubers available to take me to my local Bradley Airport (BDL) for my 8:25 am flight to Las Vegas for work. So I plowed a path out for my Model 3, and off to the airport I went, gladly finding one of the very last parking spots available in the Long Term Garage, but unfortunately on the roof. Gladly, a few spots were already cleared of snow, so that's where I parked. Once again, four wheel drive came very much in handy, with the factory all season snow tires handling the conditions more than well enough for me to feel quite safe on this 22 mile drive. Again, this car isn't coddled, it needed to replace my Honda Civic Hybrid in all situations that are pretty normal for life in New England. Well, my one stop Delta flight from LAS to BDL got delayed, mercifully, they re-booked me on a direct flight to Boston instead. It was up to me to get myself from BOS to BDL, this meant a one-way Avis rental car, arriving home at 1:30am on Saturday Mar 09. Much better than a red-eye one stop journey which would stretch well into Saturday! But wow, ouch, driving that Ford Focus with 32,000 miles already on it made me appreciate my Model 3 so much more. That rental was dirty, it smelled, and it made very loud engine noises when attempting to down shift to accelerate in a herky jerky fashion. It just felt ancient, but it did get me home safely to my family. I had to leave of the Avis rental car the next day, and had my son with me. When we caught up with the Model 3 on the garage roof, it was 80F inside in the sun, and there was zero chance of any residual ice from a sub-freezing overnight. Yet, the front passenger window apparently didn't auto retract, and the door seemed to not close properly. Sure enough, the window was still all the way up, on the outside of the chrome. Darn, time to request service. Notice my first issue with this window was mentioned above back on Jan 09. Appointment made for Friday, Mar 15 2019, added that I had some occasional intermittent orange flashing on my backup camera display, which was hardly a big deal, but figured if I'm going anyway. 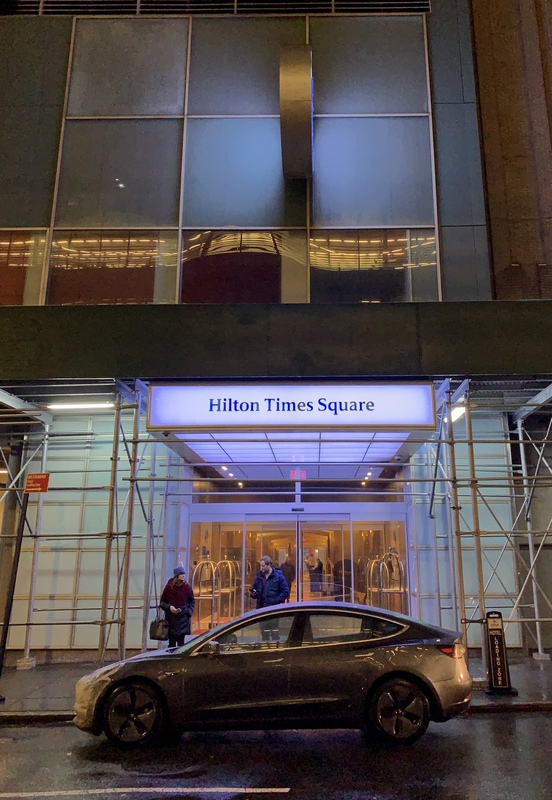 Another overnight trip to New York City earlier this week, found another garage with Tesla charging, details here. 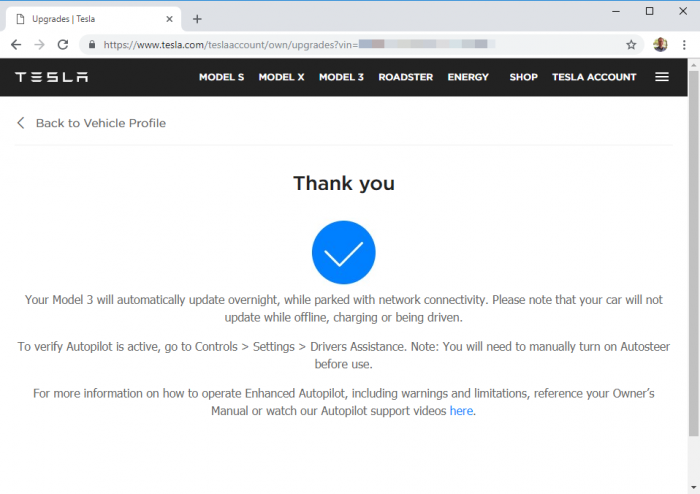 Went from software version 2018.50.6 to 2019.5.15 on Tue evening Mar 12 2019, the first day this was finally showing as available to me, see also TeslaFi Software Tracker for rollout progress. New side views in saved and recent /TeslaCam folder on my USB drive, haven't noticed this potential issue with USB filling up, at least not yet. When testing the use of Autopilot around town (40 mph roads), the algorithm for centering between the pain lines is more aggressive, with the car more abruptly changing the path to maintain center, this can be odd when two lanes become one. Losing the right lane, and your car veers to the right as the space between the left and right paint lines temporarily becomes large. To enable the new Sentry Mode after the update, you need to open up the Tesla app on mobile, select CONTROLS, then turn the SENTRY MODE slider on. Alternatively, from the Model 3's touchscreen under Controls, Safety & Security, Sentry Mode. The new auto-fold of the side view mirrors based on location worked well for me, but now I need to rely on the rear view camera view only when backing out of my driveway. When my Model 3 LR AWD is in my garage and plugged in, it begins charging for 3 minutes, roughly every 55 minutes. It isn't doing anything other than saying it's going from 90% to 90%. So far, the only work-around that I've found is to charge to 90% when I get home, then move the Charging "Set Limit" slider to 80% after it completes that first, actual charge. Sense Home Energy Monitor no longer recognizes my Model 3 charging sessions, as reported here. Tesla of Milford CT's loaner 2015 Model S 70D with 30,000 miles on the odometer, and 240 miles of range. Today at 11:15am was my Tesla Milford CT Server Center appointment. The 50 minute drive was easy, and drop off staff were quite courteous. I also took some pictures of the damaged chrome. Everybody was great at keeping me informed, and handled my many questions about this appointment, and service policies there in general. Why? Because this is the only service center in Connecticut, so it's by far the closest one that I'll likely be visiting again. Those light leather seats don't look great when yellow with age. I was told it might take 2-3 hours to fix. After hanging out in the huge waiting area for only about 45 minutes, a representative came out to tell me that the issue with the door/window assembly was different than what they expected, and it would take longer to fix than they though. I was told that it would likely be best for me to drive away in a loaner Model S. I'm impressed that they offer me this option, instead of an Enterprise rental, I really didn't think Model 3 owners would get this sort of premium treatment. I did have to sign a form about penalties for speeding, and/or driving more than 200 miles per day, along with providing them with a credit card. For security, I hope that form gets shredded once I return the car in the same shape it was in. The plan now is for Tesla to call me later in the day to hopefully get my car back before closing at 6 pm, or during their handy Saturday hours that are for pickups only. All in all, my car feels twice as good at half the price, but I'm super grateful for the wealthier folks who blazed those early-adopter trails long before I did, making the much more refined Model 3 possible. For TeslaFi, you can sign-up for a free 30 day trial, or use this non-affiliate sign-up for a 14 day trial instead. I also found another excellent, technical video by Matt about the sound system features and bit rates. Consider contributing to Matt on Patreon as well. 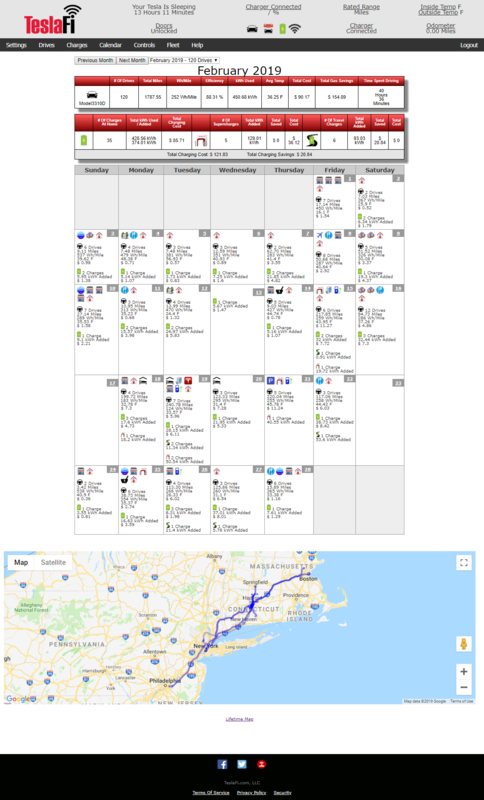 This dense TeslaFi Calendar view of my February drives is really pretty incredible. I didn't order this $4000 option with my Model 3 that came with AP 2.5 (AutoPilot hardware version 2.5), hoping the price would drop. I later tried the EAP (Enhanced AutoPilot) feature for 30 days, then decided to buy it for $5000, getting me the automatic lane centering steering and TACC (Traffic-Aware Cruise Control) that I have used successfully for many thousands of miles of clear weather, clear markings highway driving. Last week, the price for FSD for customers who recently bought EAP dropped. 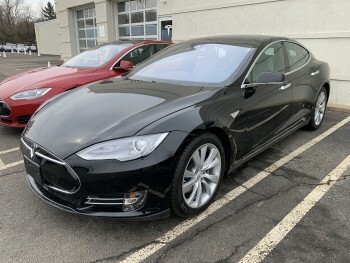 Through Monday Mar 18 2019, FSD (Full Self Driving) was available to me at tesla.com at $2000. I decided to go ahead and order it, paying attention to which credit card I had on file before doing so. Warning - you can't save two cards in your profile, only one at a time. Ryan McCaffrey discusses the price hike. No, Tesla's definition of FSD doesn't mean you can take a nap or read a book, it's still stay-alert, hands-on-the-wheel. 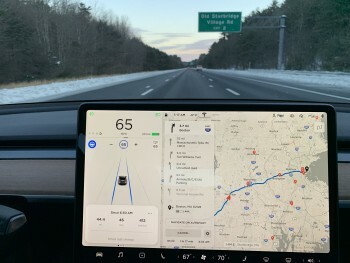 But I'm hoping that at least some features like Lane Assist will become better with newer hardware on board, and that's my primary driver in my decision. 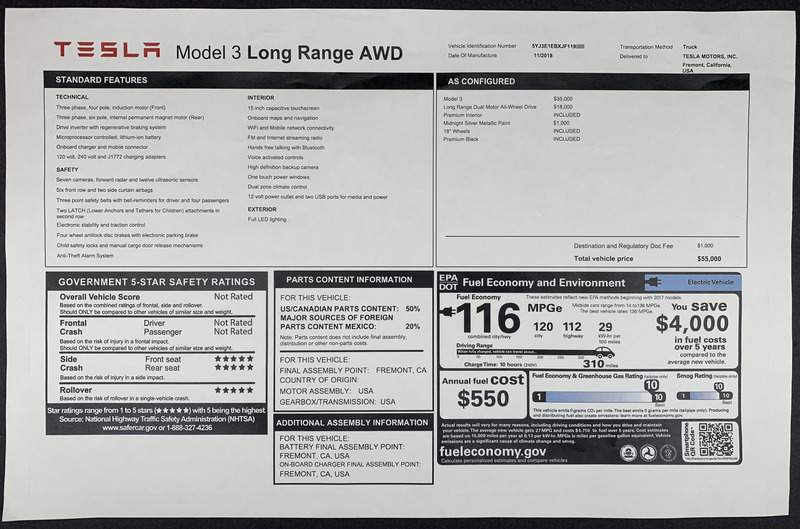 Ordering this now is a big risk in case FSD ability never arrives due to regulatory constraints or other unforeseen impediments, but at least the risk is halved, if $4000 winds up being the FSD price. 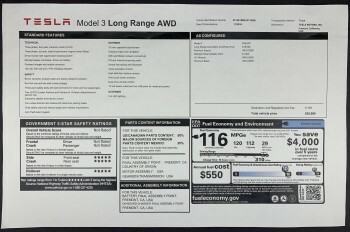 Ordering FSD early may also help me have a greater probability of being able to blog about FSD earlier, presumably getting me a little better shot at getting my half hour swap of my GPU/computer behind the glove box done sooner, maybe even using the Tesla Mobile Rangers to avoid the drive to the Tesla Service Center. It's anybody's guess what Tesla will do with that Full Self Driving price between now and whenever installs of AP 3.0 hardware become available. This next update is pretty darn remarkable. Based on experience and an analysis of the telemetry data, Tesla has decided to up my power by 5% via firmware update. Awesome! I do wish that Tesla would stop bragging about absurdly high top speeds though, instead doing something like Volvo's plans to limit speeds to 112 mph in 2020. Launched in July 2017, the Model 3 now numbers in the 223,000s according to Bloomberg's tracker. See also Introducing V3 Supercharging published by The Tesla Team on March 6 2019. Service Update - I called Milford CT Tesla Service for an update today, and the required parts for the repair arrived today as expected. Repairs should be complete by late morning Tue Mar 19. This is good, as I have a work-related road trip coming up to NYC & NJ this Wednesday to Friday, and I much prefer having my own car with my own stuff. Having less worry that the right window/door assembly might malfunction for my wife will also be good, especially since that was the only remaining unresolved problem of any significance. The slight moisture in the fog lights went away on its own months ago, and the occasional orange flicker of the backup camera view is getting fixed with a software update. Note that I seem to have no ability to communicate with Tesla Service using the app, at least not while it's actually being serviced. None of the submenu options are relevant. I resorted to asking Tesla Service to text message me. I checked out the trunk when I had some issues with the charge port not releasing in my garage. The manual talks about an access port on the left, and when looking around, I noticed some Dynamat style sound deadening stuck on the sheet metal under there. With winter's chill easing up a bit lately, I'm imagining a time soon where full braking regen is available right when I pull out of my driveway, upping my efficiency and range. I'd also like to see my car actually clean at some point. Good thing Tesla actually offered to wash my car, since so far, I haven't laid a hand on it quite yet, just using touch-less car washes to date. Picking up my car went very smoothly, with service answering my many questions. My service rep was fantastic, and his passion for the success of Tesla was evident from the second I met him. My passenger window and door close properly now, and I was assured the service technician had tested it over and over and over again, just to be sure. This is a good ending to the one extremely intermittent problem that I had, now in my rear view mirror. Wasn't bad to have a clean car this clear day, right before many hundreds of miles I had planned for We/Th/Fr this week! 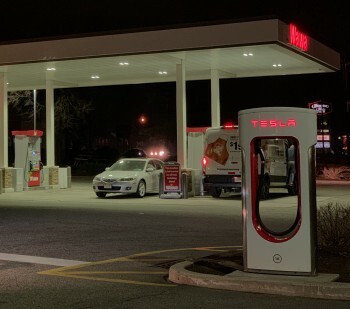 Wawa in Woodbridge NJ has 8 Tesla Supercharger spots! Drove to Manhattan in the morning, a smooth trip, and now I know where to park too. After my event attendance was done, I drove over to Woodbridge NJ, where a Supercharger happens to be less than mile from my hotel. Filled her up for about half an hour, and now I have plenty of range left for the drive home tomorrow. I didn't have to charge that long, I was just checking out Wawa anyway, and sharing. I also turned on Sentry mode, for a little extra piece of mind when parking behind my hotel overnight. 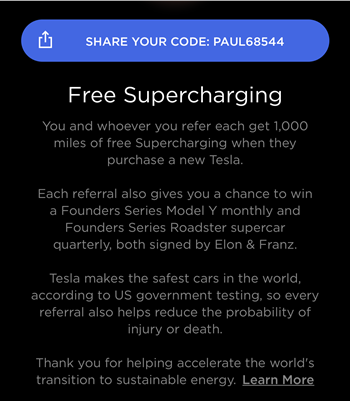 Tesla's new referral program announced Mar 21 2019, click for details. Heavy rains this evening here in NJ, but again, such a solid glued-to-the-road experience, I need not fret about it. Not a false sense of confidence at all, one that has been built up over these past 5,600 miles of safe driving experiences in all sorts of horrible weather. Never had a car that ever felt anywhere near this safe to drive in crummy weather. One minor I noticed today was that Sentry Mode may have deactivated itself for some reason this evening. Not sure why, but I'll keep my eye on whether it happens again. It was no big deal, as I simply made sure it was still on when turning in for the night. A surprise from Tesla this evening, with the referral program coming back. Should you find my content and videos of value, my code to enter when you make your Tesla purchase is PAUL68544. Sentry Mode still on this morning. With temperatures staying right in the mod 40's°F last night into this morning, after about 10 hours, battery range showed a loss of about 10 miles, dropping from 170 mi to 160 mi. This is some evidence of the increased battery drain from Sentry Mode. Very results the previous night. Still enough range for my drive home planned for later tonight, but I also have some driving to do to get to an event here in Woodbridge NJ today. We took delivery exactly 3 months ago! No regrets, still the smiles. I did a bunch of errands around town with my wife today, including a trip to Sam's Club where it was evident just how much more trunk capacity this car has than my Civic Hybrid had. My wife noticed the right-side window button was intermittent at first, always working on the second push. A few pushes later, it seemed to work every time. We'll keep an eye on it. There will soon be 8 happy new Tesla Model 3 owners, spotted this truck on I-84 East-bound toward Boston on March 31 2019. Just marking the beginning of April, so the now-month table of contents above can link you here. Great discussion between Alex Guberman and Eli Burton. 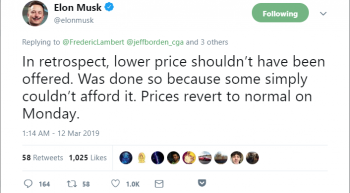 Not just the bad, but also the good, the incredible value of Elon responding to owners publicly on Twitter. It's "delightfully effective" for public suggestions for features and fixes to be implemented in just a few months, it's incredible. Elon goes on to say he's still waiting for anybody else to do this even half as effectively. This video shows that my successful and simply Model 3 software update. As shown in the video below, going from to 2019.8.3 to 2019.8.5 took about 26 minutes. Best viewed fullscreen on mobile in portrait mode. Honestly, this is a bit soon for me to really trust this, figuring originally that FSD-like features like this would require AP 3.0 hardware, not the AP 2.5 car most Model 3 owners are on. 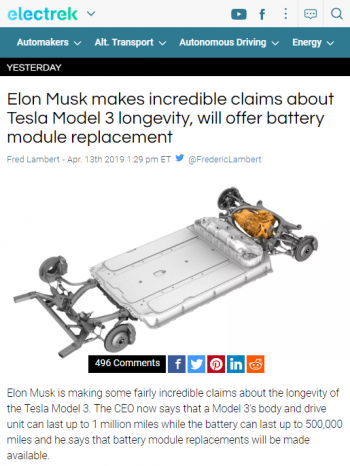 But it is certainly exciting to see this innovation moving forward already, and I seem to be getting my firmware updates quickly lately, then again, see also TeslaFi Software Tracker, that's a whole lot of 2019.8.5 getting pushed out there today, with 1113 TeslaFi subscribers already running it. Drove around a bit to test the automatic lane changes, and wasn't terribly impressed, but it was still very intriguing to try it. The hesitancy in lane changing which are sometimes inexplicably delayed for a very long time can make the system appear as if a very inexperienced driver is behind the wheel. More time testing (safely, at speed limit) is needed. As mentioned in our Model 3 review, all Model 3s have a camera on the rearview mirror, pointing into the car. The user manual states that the camera is not activated yet, but some owners have wondered what it’s for. Found myself following this Model 3 today. I'm not entirely sure snarky plates like this open minds to the benefits of EV. Maybe it's off-putting, and reminds folks that some EV owners can kind of be gasholes. Not sure I'd want to encourage keying behavior, like such plates may foster, but that's just me and my personal opinion. The world is far more interesting with all sorts of folks in it, to each his or her own! Interesting that the new FSD (formerly called AP 3.0) hardware is now coming of the Model 3 production line, see Tesla confirms new full self-driving computer is in production, will demonstrate capability this month, with the public demonstration planned for April 19th now pushed to April 22nd. 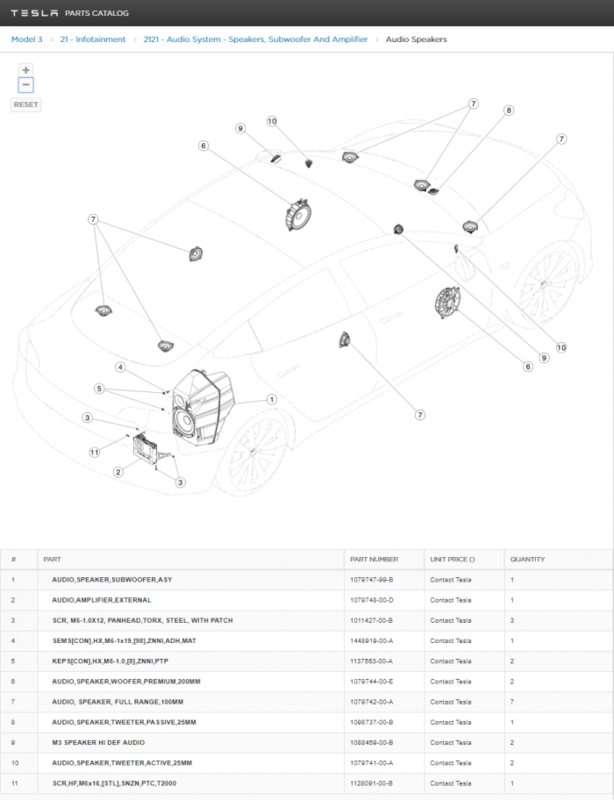 Also interesting to poke around the parts catalog for the Model 3 here, to me anyway. You can hear Seth Weintraub discuss his feelings on the Model 3 versus the current Model S, sharing many of the same thoughts I left under this video in the comments. It's just a better car in every meaningful way for both me and him right now. But the news of new motors for the Model S and perhaps other changes imminent, the outlook for Model S lovers is likely to change very soon, for the better. I enjoyed seeing a close look underneath a rear wheel drive Model 3 in this video below, featuring a look at glycol hoses & radiator, along with an oil filter. That's right, EVs have some of those familiar parts, but less of them, with longer service intervals. Sandy Munro warning up to Tesla a lot since last time. 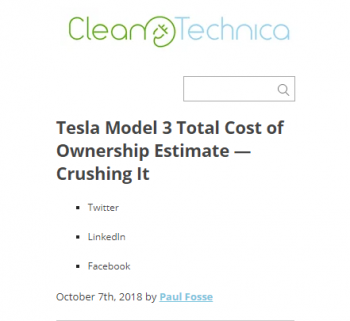 Much like I did with the earlier Sandy video above, Paul Fosse gives us a wonderfully summary index at CleanTechnica's Auto Industry Expert In Lean Design, Sandy Munro, Gushes Over Tesla In New Video. And now, an even messier video with dismantled vehicles, awesome! I had a chance to have my octogenarian mother take a turn driving her first EV today. First, adjusted seats and mirrors. I also quietly turned Creep mode on and Regen down, which I mistakenly forgot to do when my sister had driven once last month. I wanted to make the experience feel much more like a "normal" car. It went well. No crazy acceleration, but she certainly appreciated and commented on the instant pedal response. Always all safe driving, all good. Feels normal, she said. She certainly enjoyed Sorry, no video to share, as I didn't want to make her any more nervous, and I needed to focus on answering the slew of questions new drivers invariably have for that first shift into drive, then it was all quiet from there. I need to remind readers that I'm the pilot in command of this vehicle. As the driver who can override any actions the car may suggest, the car gradually earns a bit more of my trust these past 6,600 mostly-highway miles. a) the driver's hands are on the wheel. b) there's no traffic in the lane it's planning on entering. In other words, it's not scary, as long as I stay completely aware of what is happening at all times. In the video below, I try to cover my own personal use cases for Navigate on Autopilot. My family's reasons for this vehicle choice are discussed earlier in this article, focused much more on efficiency, economy per mile, and safety. 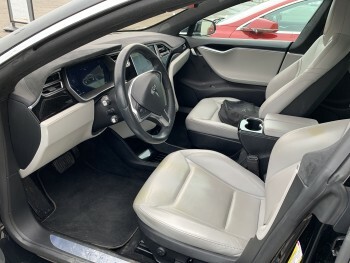 Over time, like many Tesla drivers, I have begun to realize that some of these niceties that are geared toward an even safer driving experience down the road are becoming more and more intriguing, and less and less scary than they seemed before I had a chance to drive a Tesla for myself. Have a look at the video for yourself, then feel free to leave your constructive observations as a comment, curious what you think about this less than perfect, real-world demonstration of some pretty amazing advancements in not just software, but the Neural Net becoming smarter that is the smarts behind this new software. See also Tesla’s Navigate on Autopilot performs amazingly with automatic lane changes at Teslarati. If you want to see footage of a much riskier around-town driving using Autopilot (which I still think should be called Copilot), have a look here. The most recent entertainment addition is support for video playback, Chief Executive Elon Musk said on Twitter. 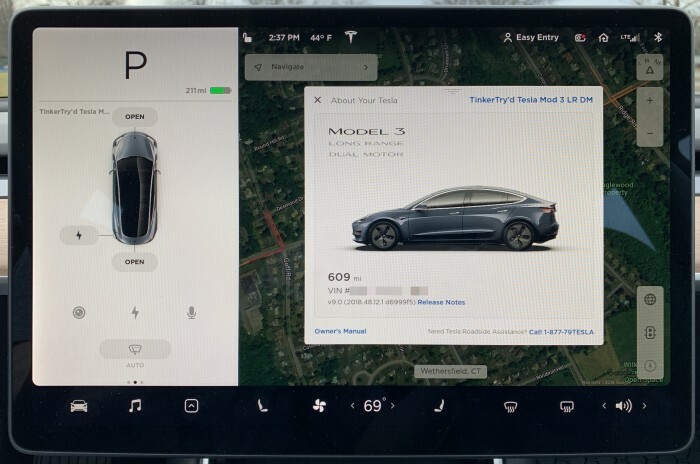 The feature will be available while the car is in park and connected to a WiFi network. It's been an amazing couple of weeks in Tesla news lately. The Model 3 was the #1 selling vehicle of any type (gas or EV) in The Netherlands last month, along with several other European markets, especially Norway. These kinds of numbers despite the fact that only the most expense Model 3 versions being exported there, so far. Then there's the million mile longevity claims, and batter pack longevity expected to be between 300,000 and 500,000 miles. 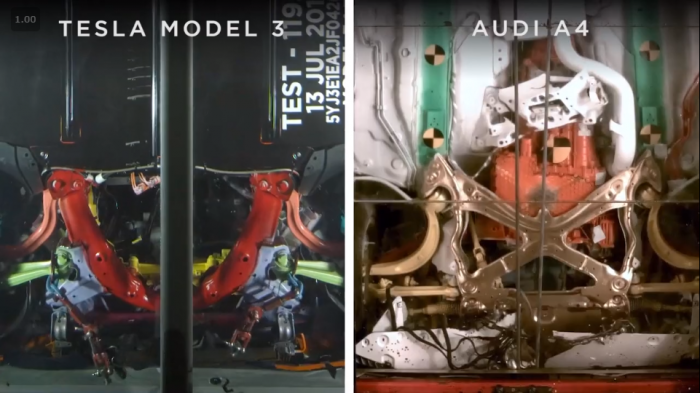 Then there's the 5% increased power through a software update, and a look inside the guts of the vehicle when dissected, and news that the Model 3 is holding its resale value better than any other car right now. 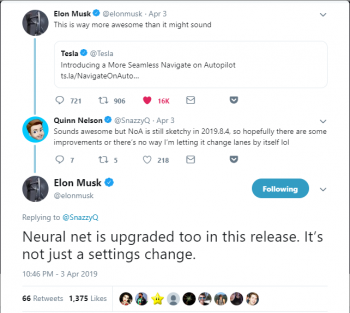 Finally, there's the neural net improvements, coupled with our current hardware, hitting around 80% of capacity, but with the new FSD (Full Self Driving) computer arriving in all new Model 3s built in April 2019 onward reducing that to 10%., the rest of the year is looking even brighter. Yes, this FSD is available as retrofit for existing Model 3s built recently like mine. 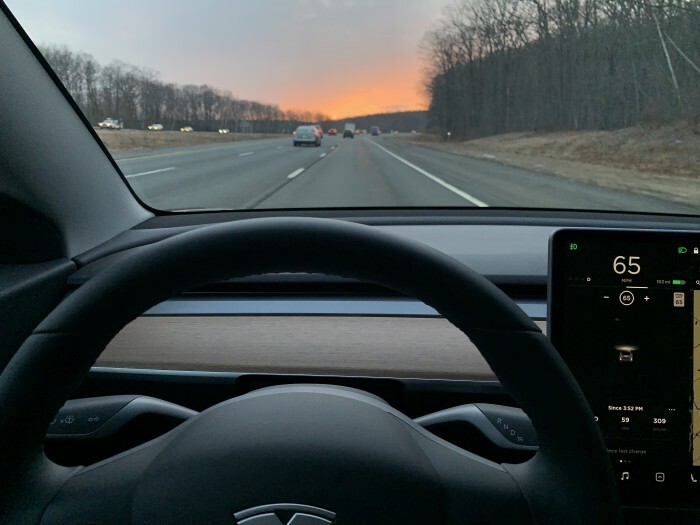 I've been hitting the road again for work again lately, and with each trip, I'm becoming more and more impressed with what Autopilot can do with each software update. I'm now on 2019.8.15, and it's pretty amazing how much better my car has become since I bought it nearly 4 months ago. There's the added alarm features that I've been using when parked in cities, including video recording. There's the dashcam enabled now with side cameras. 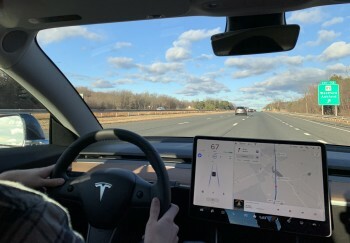 Then there's the improving Autopilot, with more automated lane change options that can be overridden with ease at any time, or turned off completely, for those of you reading this and freaking out a bit. Tried it out with my wife yesterday, and she barely noticed anything, which is saying something. It's not until you've actually driven in a Tesla that you'll begin to see what's actually possible today. Only after driving one yourself, on long road trips, then you'll really get to see how much better you can feel upon arrival, with a little bit of the drudgery of long-haul drives reduced. Today, a day trip to New York City for work, and parked at LM 29 Park, LLC. for my 3rd or 4th time now, with zero damage, and a big greeting from the friendly and now familiar staff. This is good. No need to pay the $10 fee for a charge-up this time around though, with warmer weather, I had enough capacity to get to NYC and back home again with 14% left to spare. Today was Tesla Autonomy Day. Significant announcements from Tesla were expected during their 2pm Eastern time live streamed presentation, and it's still going on live now actually. In this video segment I marked below that is cued to the right spot at 1 hour 14 minutes and 18 seconds in, you'll see an overview of the FSD (Full Self Driving) design in all Tesla models being manufactured since about 10 days ago. The whole development cycle took a little over 3 years to come to market, and it uses under 100 watts to enable retrofit into existing vehicles, such as my Model 3. Yes, I've already paid my $2000 for this FSD upgrade, as I explained earlier in the article above. At first it seems improbable. How could it be that Tesla, who has never designed a chip before, would design the best chip in the world? But that is objectively what has occurred. Not best by a small margin, best by a huge margin. It's in the cars right now. All Teslas being produced right now have this computer. We switched over from the NVIDIA solution for S and X about a month ago, and we switched over Model 3 about 10 days ago. All cars being produced have all the hardware necessary compute and otherwise for full self driving. He went on to explain that event attendees will have a chance to see the latest software refinements with this new hardware during this event. I'm actually heading out on a ~200 mile round-trip to the Boston area tonight, in our Model 3 actually. Will be interesting to carefully show one of my sons just how far Autopilot has come since his last experience with it a couple of months ago. He used to manage to hit 47 mpg on our Honda Civic Hybrid actually. Great balanced view of yesterday's announcements. 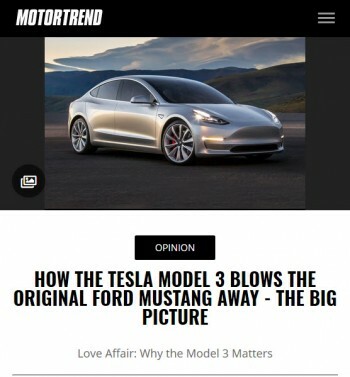 Fred Lambert does a great job at Electrek too, pulling together a bunch of articles with Tesla Autonomy Event news hub, and adding this article today, NVIDIA disputes some of Tesla’s FSD computer claims, but they miss the main point. Dec 31 2018. Notice the Odometer reading of 609 mi. Sorry about the moire pattern artifact, still learning how to take pictures of the screen properly. Dec 31 2018, window "sticker" that was inside our Model 3 at delivery.